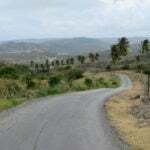 Barbados was colonized by the British, and remained a British colony until 1966, when it became a sovereign nation. 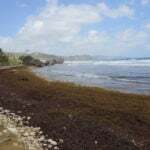 The original Arawak and Carib native population was sadly decimated by colonization, and sugarcane and slavery were introduced to the island in the 1640’s. The majority of slaves were imported from West Africa until slavery was finally abolished in the 1800’s. 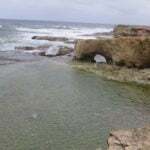 The resulting culture in Barbados today is a mix of British, Caribbean, and African cultures that is uniquely Bajan. 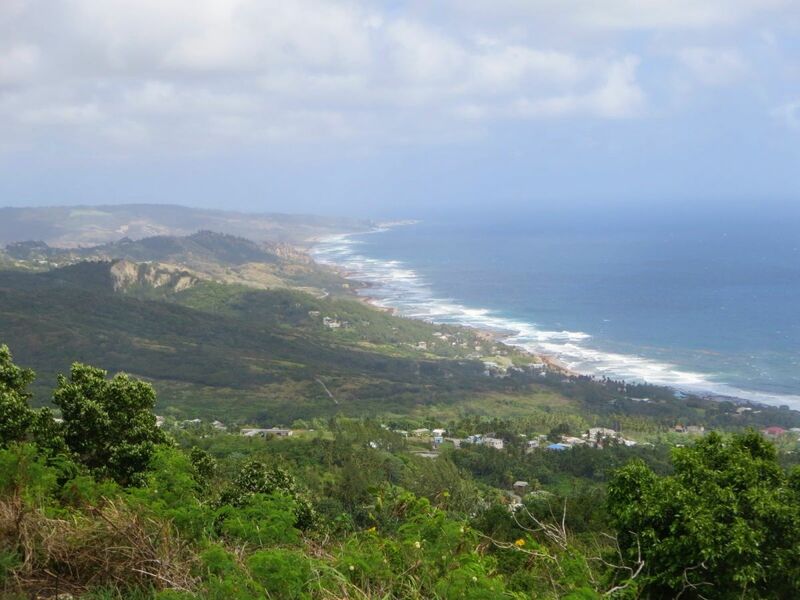 There are a couple things about Barbados that make visiting this beautiful country easy for American travelers. The first is that the national language is English, so there is no language barrier for English-speaking travelers. The second is that the Barbados dollar is tied to the US dollar, at a rate of $2.00 BBD to $1.00 USD. This makes converting prices super easy–just cut all the prices in half to convert the rate to USD. No need to exchange currency, just withdraw cash from a bank ATM with your debit card on arrival (be sure to give your bank a travel notification before you leave the country). Many stores and restaurants and all taxi drivers take cash only, so be sure to have some cash on you while you are there. There is an ATM at the airport that you can use. US dollars are also widely accepted. 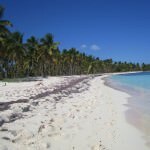 In addition, the water is clean and safe to drink, the crime rate is one of the lowest of all the Caribbean islands, and the beaches are some of the best in the world. 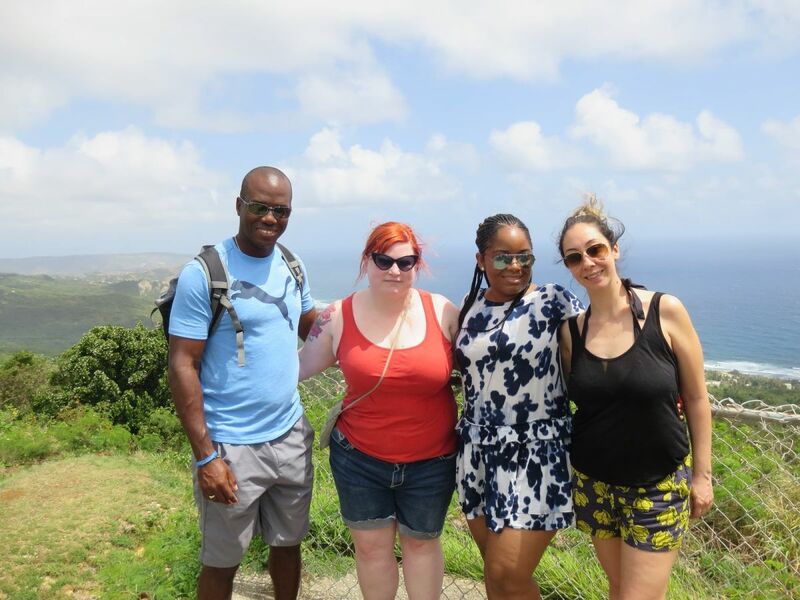 When I was a high school exchange student in Denmark in the 90’s, two of my fellow exchange student friends were students from Barbados, and this trip was our first time reuniting in 20 years. In addition, another of our mutual exchange student friends from Turkey came to join the reunion with her boyfriend as well. It was a fantastic week and an awesome experience to have our local friends show us around and share their island and culture with us. We took JetBlue overnight with an early morning layover in New York. When we arrived, the line through passport control was long but it was a quick 15 minute taxi ride to our hotel from the airport once we got through. We stayed at the Butterfly Beach Hotel on the south coast. 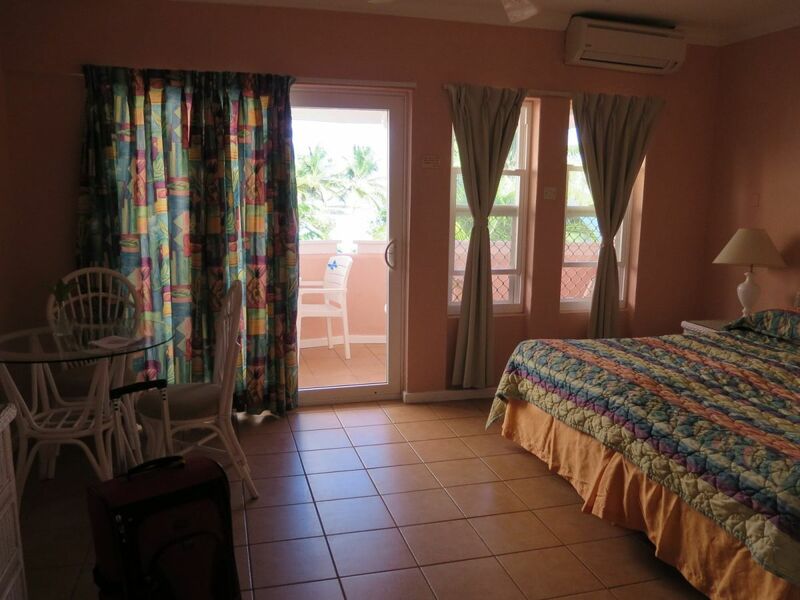 Our room was a reasonable price and included a small balcony with a partial ocean view and a mini fridge and hot water kettle. 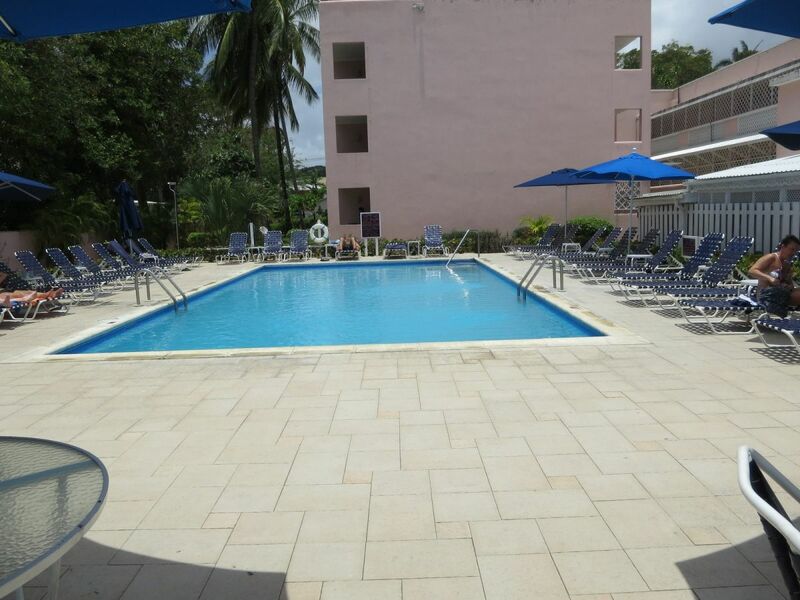 Butterfly Beach hotel also offers more expensive rooms with full ocean views, and rooms with kitchenettes for self-catering. Butterfly Beach Hotel is on the beach, but the waves were pretty rough so we didn’t go swimming here. 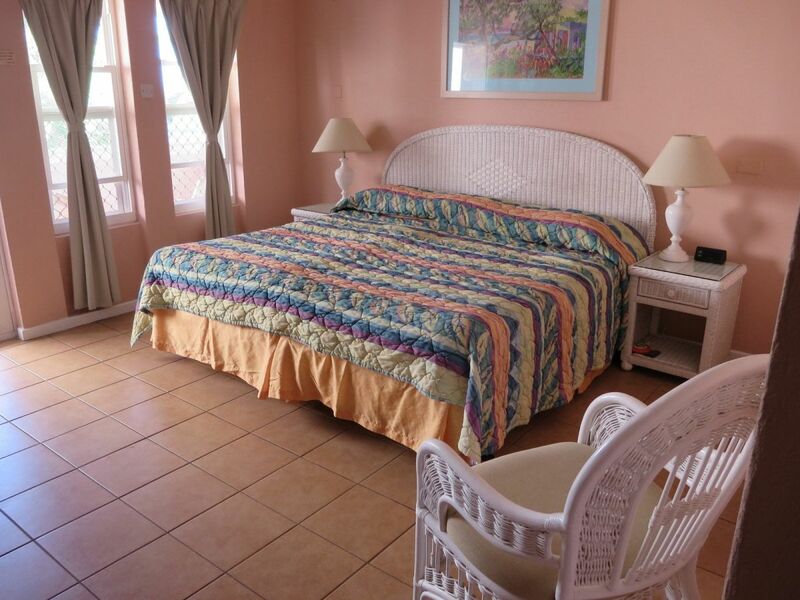 They do have a nice pool and plenty of lounge chairs with ocean views. We were starving when we checked in at 3:30, so we unpacked our stuff and headed down to the hotel bar for a little snack and a beer. 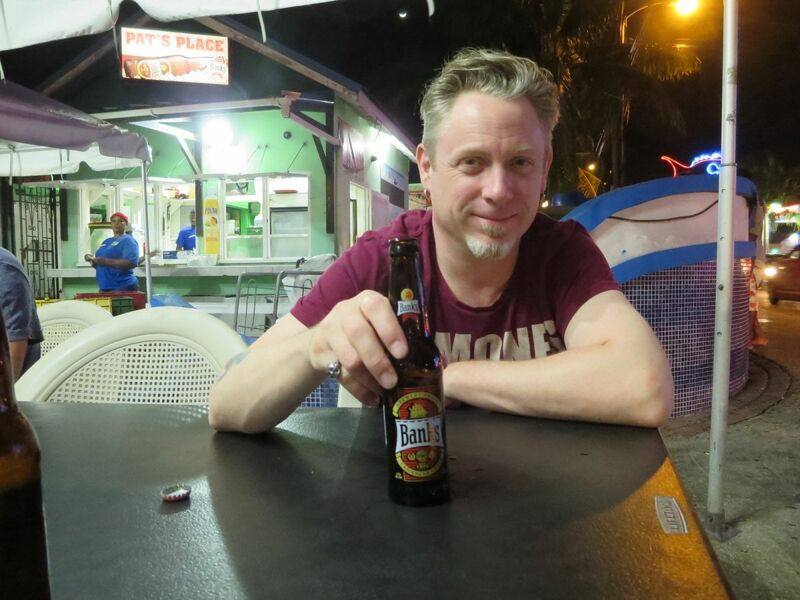 We had Banks Beer (local beer in Barbados), Bajan fish cakes (deep fried balls of salt fish mixed with dough), and chicken wings. We loved the fish cakes. We had thought we were going to dinner at 7:00 and would have some time to rest a bit, but my friend Damien messaged me and told me the only reservation he could get was at 6:00 and he would pick us up at 5:45. It was 4:45, so we rushed back to the room to shower and get ready to go. No nap time for us. Dinner was at Shakers Bar & Grill in Brown’s Gap. 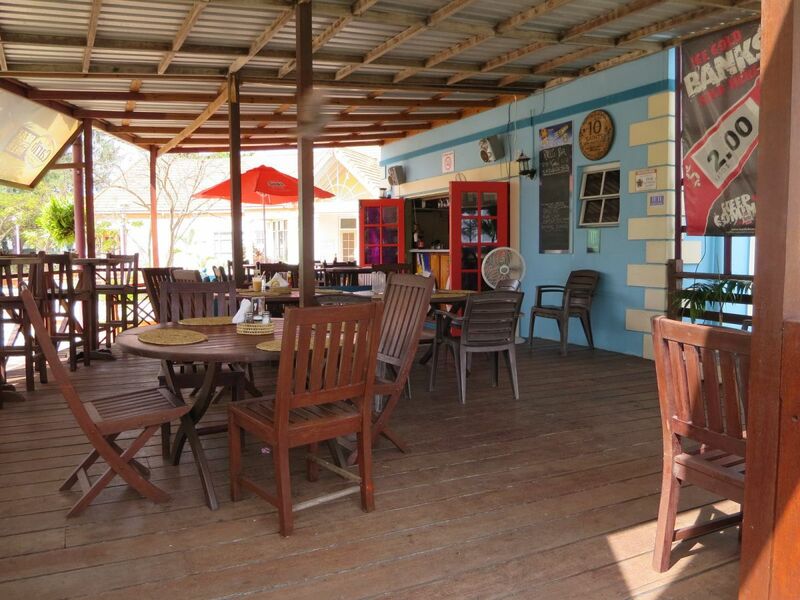 According to Damien, this is one of the favorite local restaurants on the island. 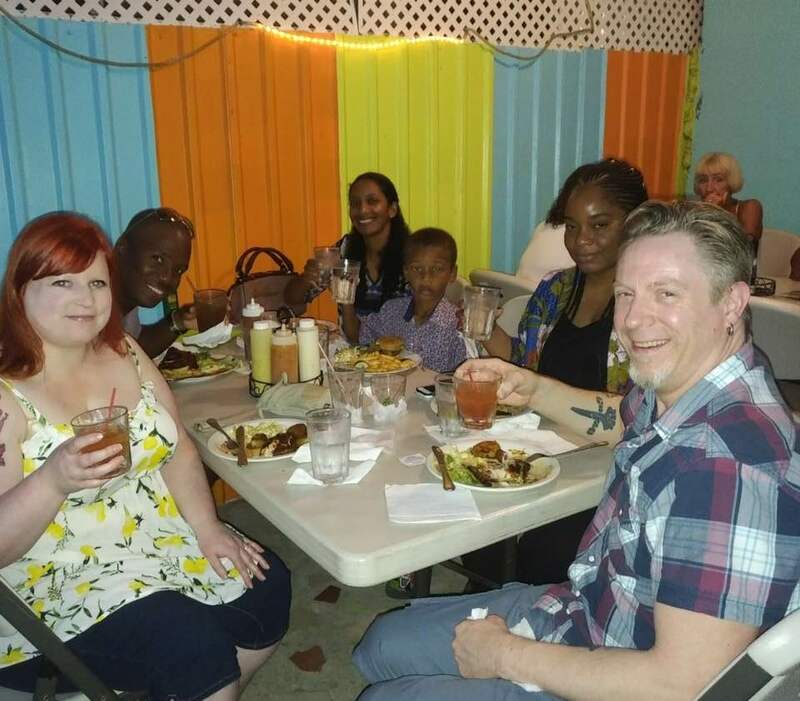 We met with Damien’s wife Kyesha and his son Dimitri, and my other Bajan friend from my AFS Denmark exchange year, Monique. 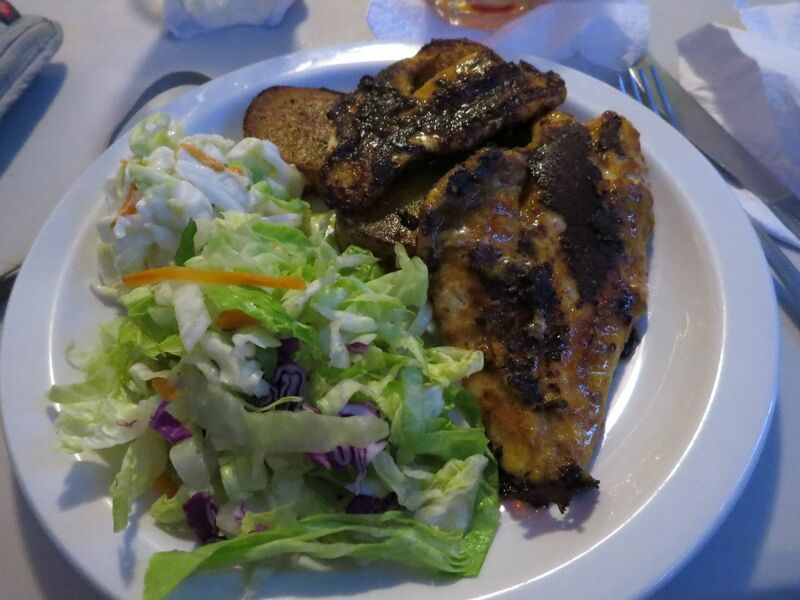 I had blackened lionfish with grilled potato and salad, and Paddy had BBQ chicken. It was delicious and reasonably priced. I tried the rum punch, which is the national cocktail. It was strong! Rum punch does not mess around. I had never had lionfish before. Damien and Kyesha told us that lionfish are an invasive species and are devastating the fish population and coral reefs in the area. 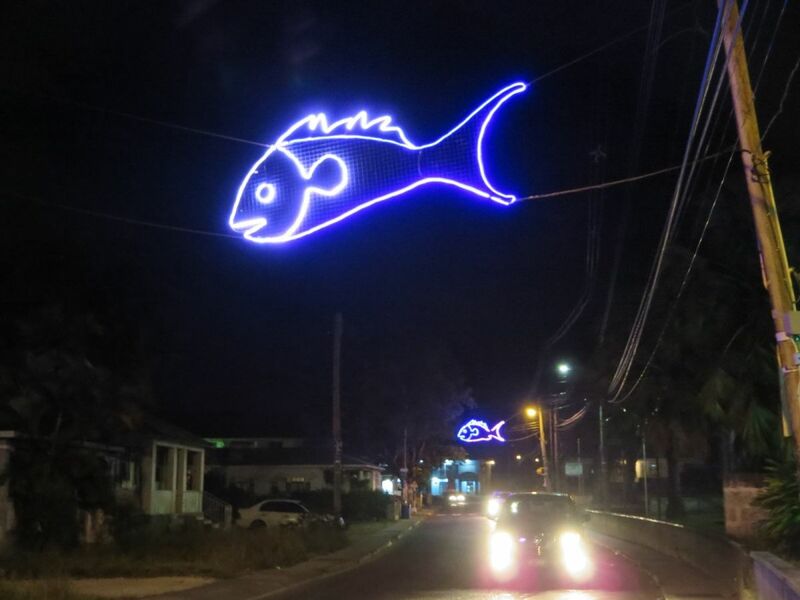 Fisherman have been fishing them and encouraging people to eat them as an effort to control their populations. 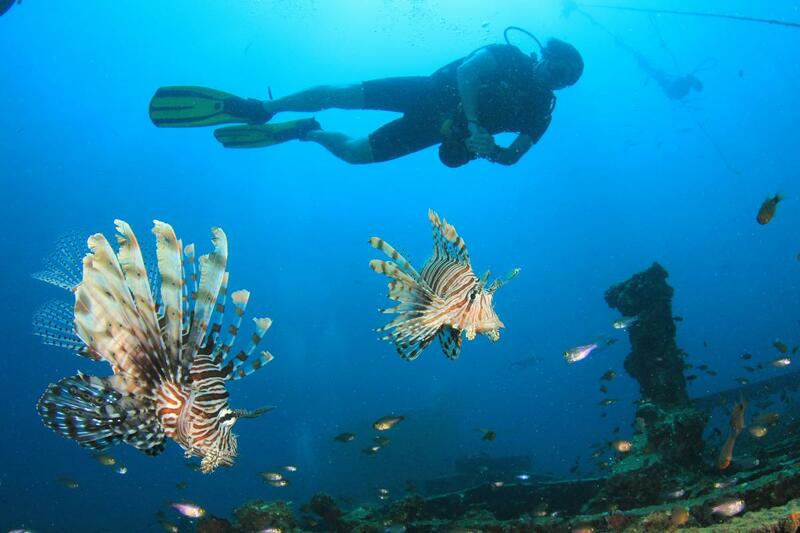 I had only known of lionfish as a fish to stay far away from when snorkeling, due to their venomous stinging spines. But apparently, once you take the spines out, the fish are safe to eat (and delicious). 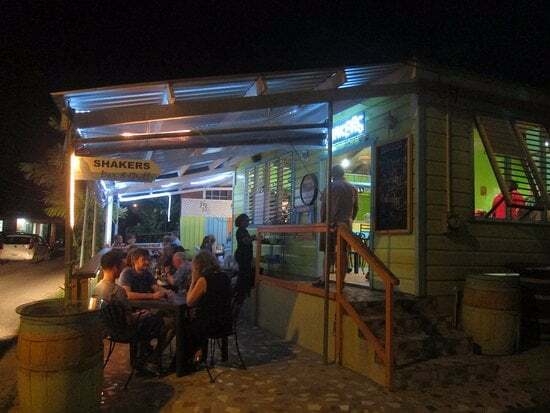 If you want a truly local experience and great local food, Shakers should be on your restaurant list for your trip to Barbados. After dinner, Damien’s wife and son headed home and Damien and Monique took us out for drinks in St Lawrence Gap. 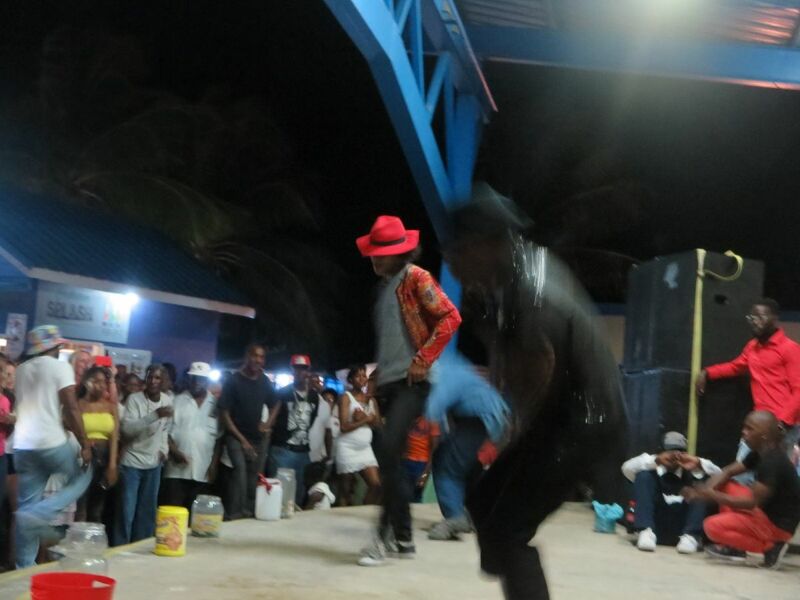 St Lawrence Gap is where the party is at. Tourists and locals mix in the bars and restaurants along this little strip on the south coast. It is the most touristy area, but also the number one spot for nightlife. 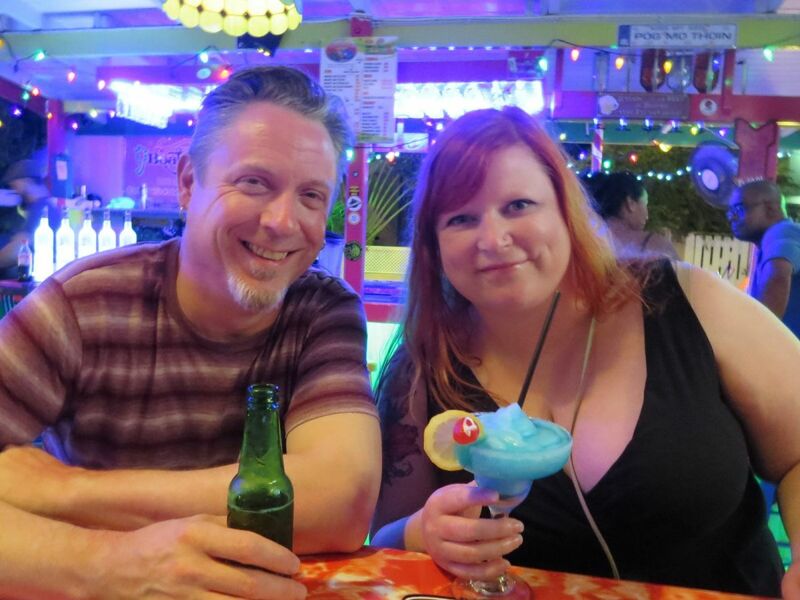 We went to Damien’s favorite spot, Hal’s Bar–a low-key open air sports bar with strong drinks and continued to catch up on the last 20 years. We had to call it a night around 11:00 , we were tired from traveling. Before we went back to the hotel, Monique insisted that we had to try the BBQ pig tails from the street vendor outside Hal’s. At first, I was picturing the long, curly part of the pig tail and wasn’t sure what eating that would be like. But BBQ pig tails are actually the tail bone of the pig with the little nub of a tail at the end. The long curly part is cut off and not used. They are slow cooked and tender, and were kind of like a pork rib. They were delicious! Don’t be afraid to try the pig tails, or you will miss out. Be sure to grab extra napkins. Our first full day in Barbados was Sunday, and Monique and Damien had plans with their families, so we took the day to relax and recover from traveling. We started our day with breakfast at the Surfer’s Cafe, a 10 minute walk down the road from our hotel. We snagged a two person table overlooking the gorgeous beach. The prices weren’t super cheap, but not crazy expensive. The view was worth it. 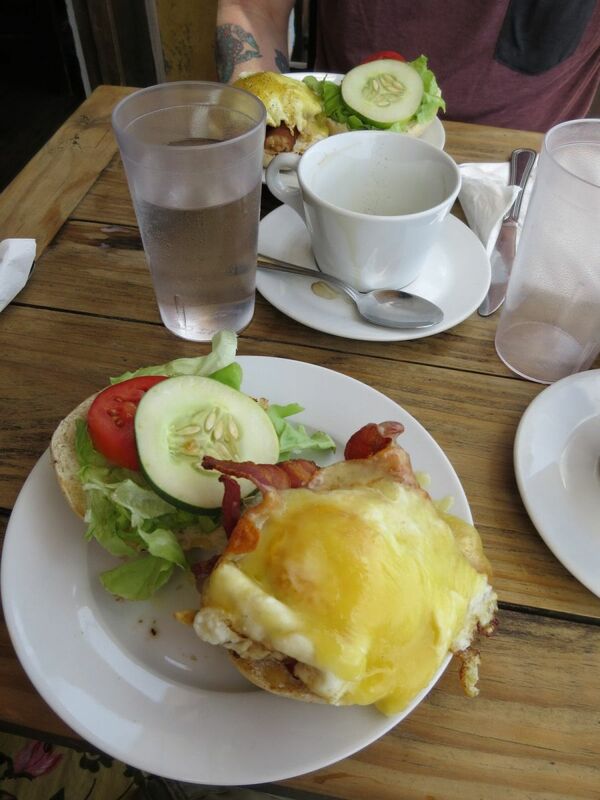 We each had the Barrel, a breakfast sandwich with egg, cheese, bacon, lettuce, tomato, and cucumber. It was the perfect amount of food. Coffee was great. The service was on island time (a bit slow), but we weren’t in a hurry. Be sure to come here if you have time to relax, if you have limited time it is not the best choice. 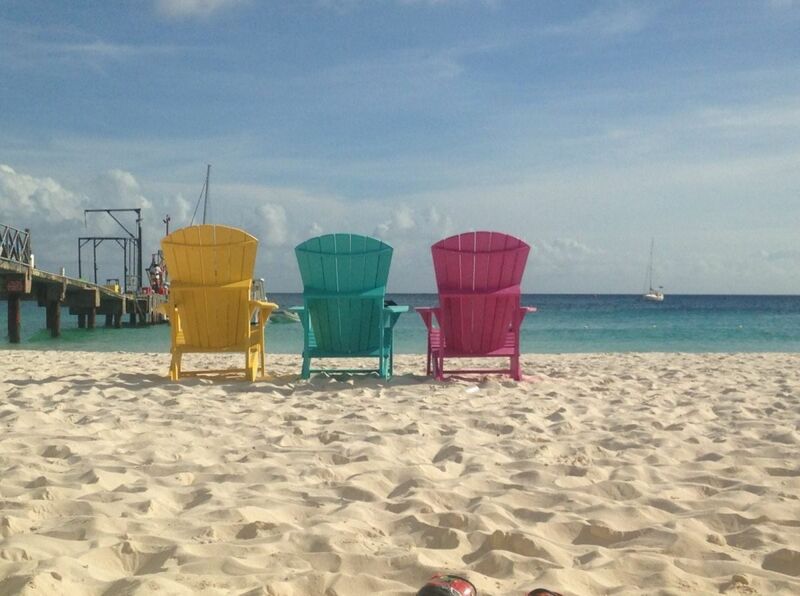 According to our local friends, tipping isn’t expected in Barbados. It is nice to leave 10% for really good service, but not expected as in the US. Often there will be a 10% service charge already added to the bill. After breakfast we walked across the street to Massy grocery store to stock up on water, bug spray, and beer. I bought a loaf of whole wheat coconut bread in the bakery section which was pretty good– a bit sweet. We always love going to grocery stores in other countries to see what people eat. We spent the rest of the day relaxing by the pool at the hotel. 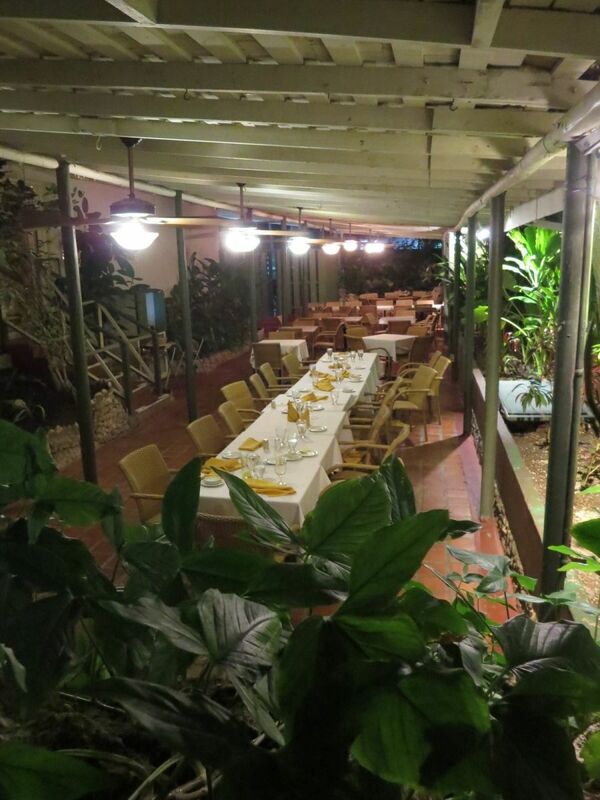 That evening we wanted to eat at Brown Sugar, a restaurant serving upscale Bajan fare. Looking at the map, it appeared to be next to Brownes Beach, and we figured there were probably some beach bars nearby that we could have a drink at beforehand. We hired a taxi to take us within the vicinity of Brown Sugar. He was surprised that we didn’t want to go to one of the fancy tourist restaurants on the beach. He wanted to make sure we knew that it was more of a “jungle” setting and not on the beach. We were fine with that. Having reviewed a lot of the popular upscale restaurant menus online, they all seemed like a lot of money for food we could probably get at home. We wanted to try local flavors, and a beach view wasn’t a priority. We were dropped off on Brownes Beach, the sun was starting to set. 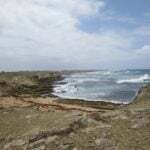 We walked up the main road towards Bridgetown, searching for a beach bar or anything interesting. Unfortunately, there was nothing along this stretch of road. There were a few small restaurants that were closed, but not much to see or do. We walked about a mile, thinking there had to be something around the corner, but there wasn’t. We turned back and went to the restaurant. Our taxi driver said that Brown Sugar was popular for their Caribbean lunch buffet with cruise ship tourists and locals. Dinner is more relaxed. We had no problem getting a nice table without a reservation. Brown Sugar isn’t really in the jungle, but once inside the restaurant you wouldn’t know that. Lush tropical plants surround the restaurant and frogs and crickets chirp, giving the open-air restaurant a tropical ambiance. 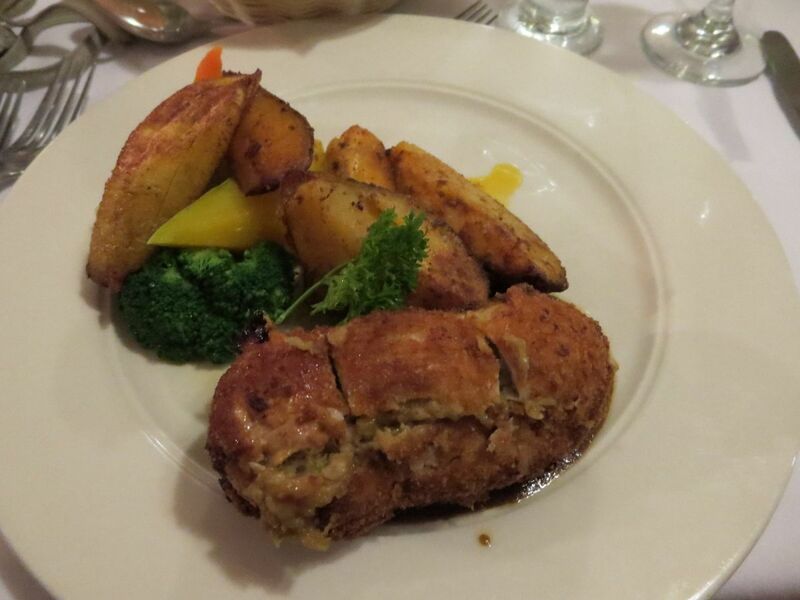 We both ordered the Stuffed Roast Pork Caribe, which was pork stuffed with bacon and plantain stuffing and Bajan gravy. It came with potatoes and vegetables and was delicious! They had tempting starters as well, but we weren’t starving and the entree alone was the perfect amount of food. Prices here are a little spendy, but not nearly as expensive as the tourist restaurants on the beach. We couldn’t pass on the dessert menu. 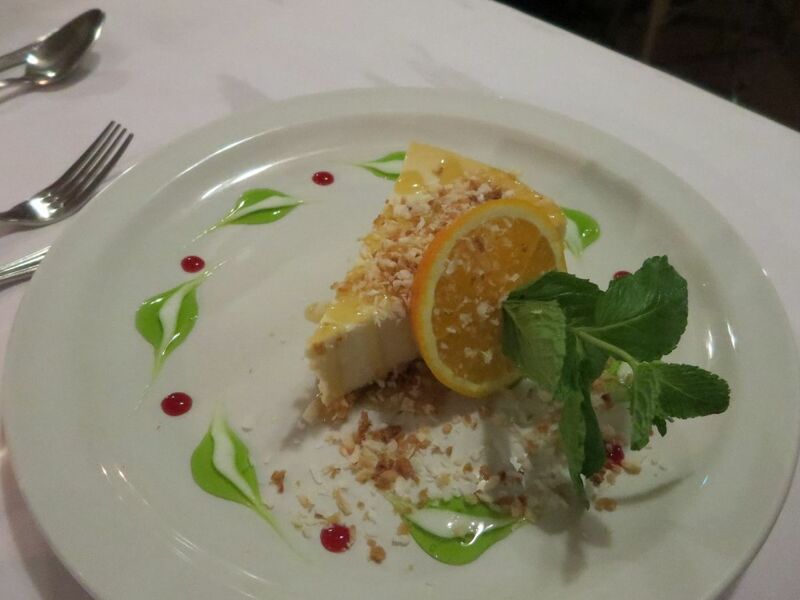 I had the orange coconut cheesecake, and Paddy had the Caribbean coffee, which had brandy and Bajan falernum (sweet syrup with lime and spices), topped with whipped cream. Dinner at Brown Sugar was one of the highlights of our trip. We were worried it would be touristy, but it was romantic and the food was outstanding. 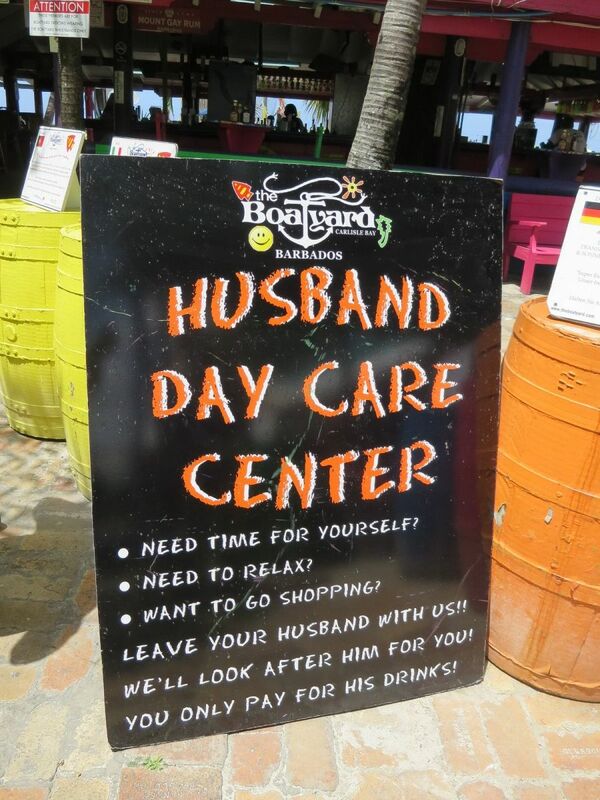 We would definitely recommend this place. After a day of relaxing, we were ready for a day of adventure. 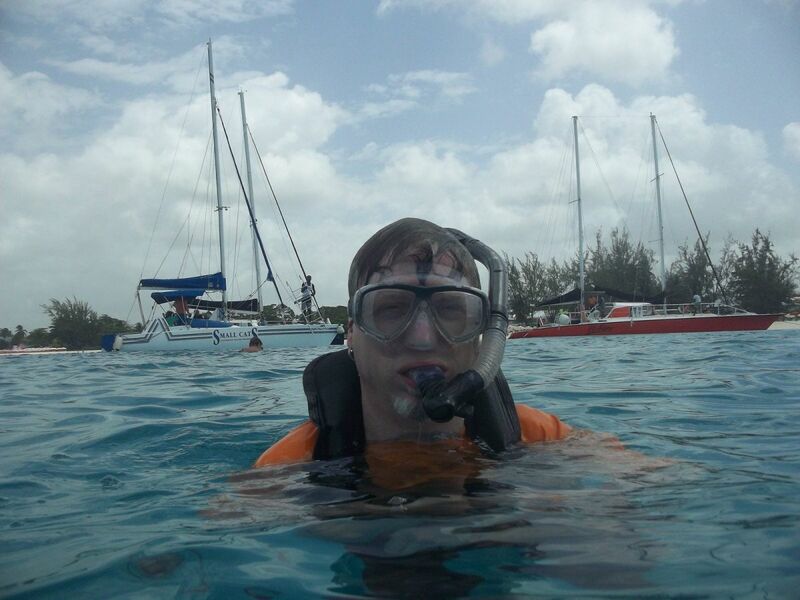 I had booked a snorkel tour with Stiletto Catamaran Cruises. I get seasick, so I opted for the three hour tour instead of the full five hour tour with lunch, hoping for minimum time on the catamaran. 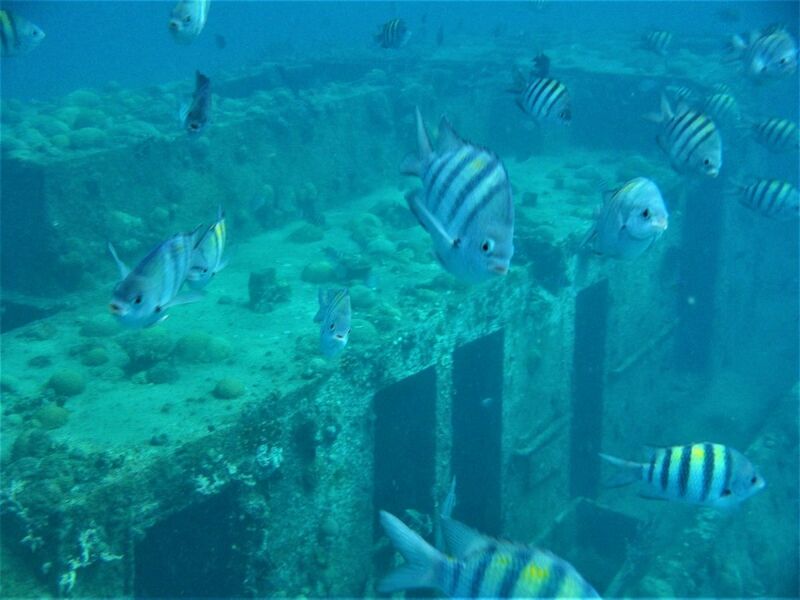 It was still a roll of the dice, but I wanted to see turtles and shipwrecks! We were picked up at the hotel in a shuttle bus and dropped off at the canal in the capital city of Bridgetown. 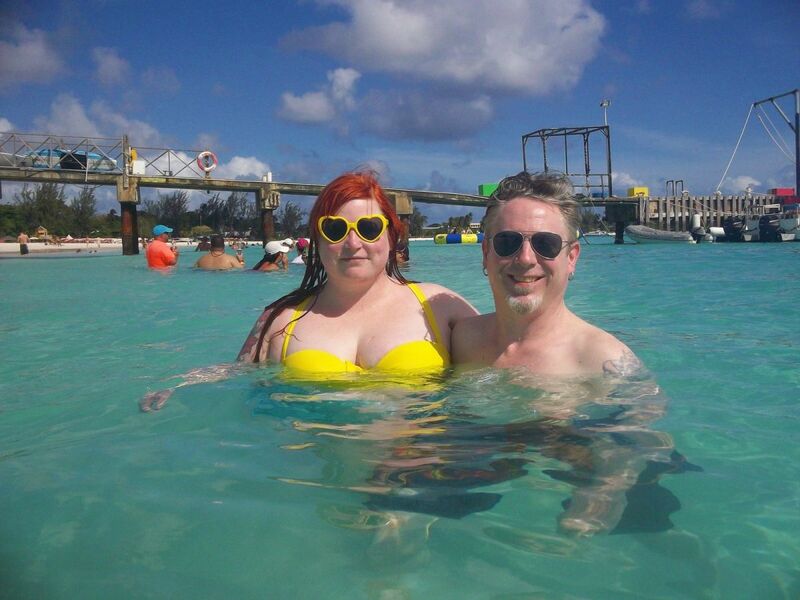 I had sunscreen, acupressure bracelets for motion sickness, and had taken two Bonine tablets. I was doing well and hoping for the best. It was hot, but there was a nice breeze. 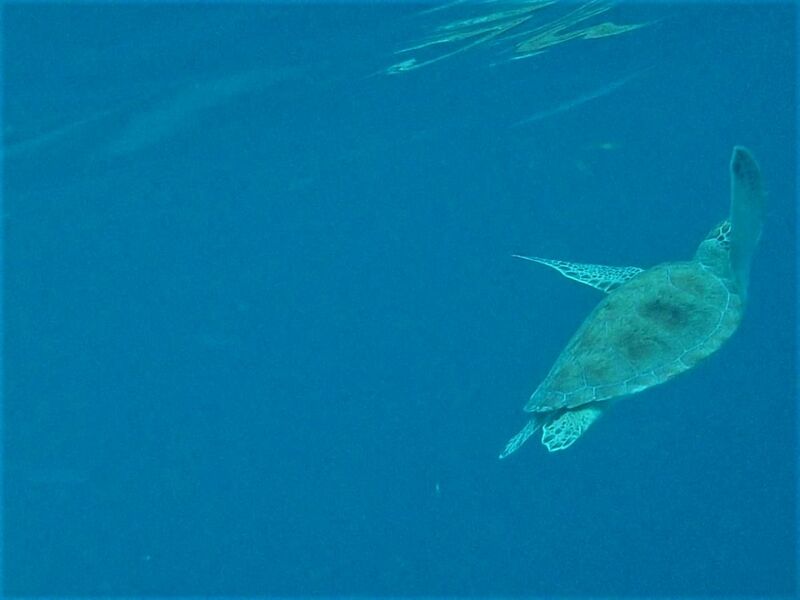 The canal was calm, and it didn’t take us long to sail to Carlisle Bay to snorkel with some sea turtles. 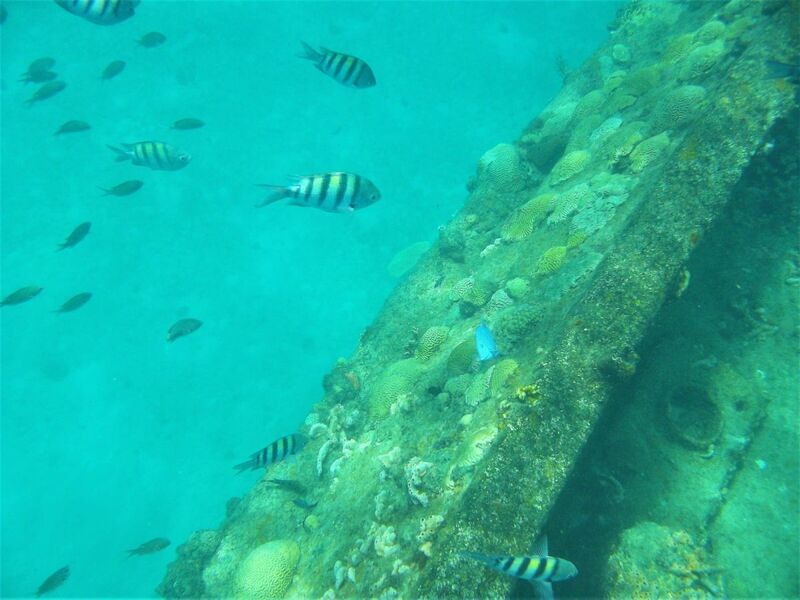 Carlisle Bay is very sandy, so don’t expect beautiful coral gardens teeming with fish. 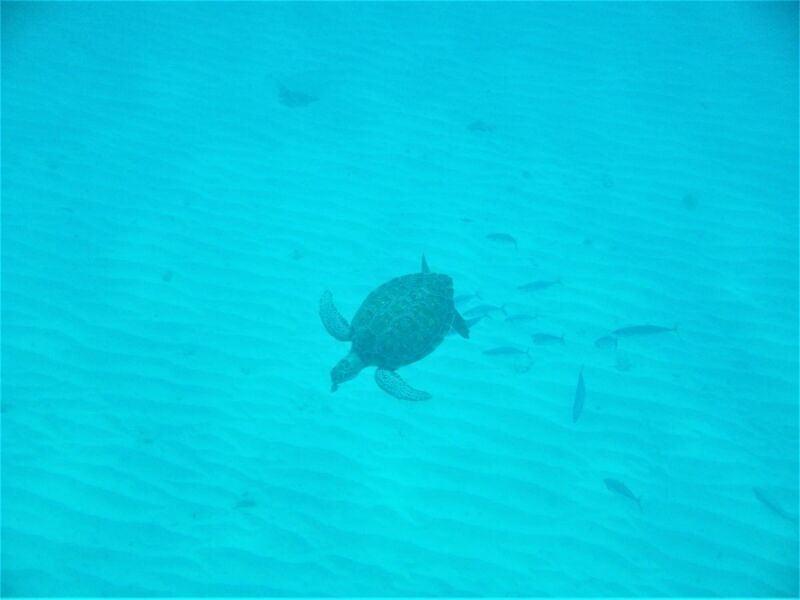 However, we saw turtles and sting rays and that was plenty exciting. Paddy had never seen a sea turtle before and he was pretty stoked. 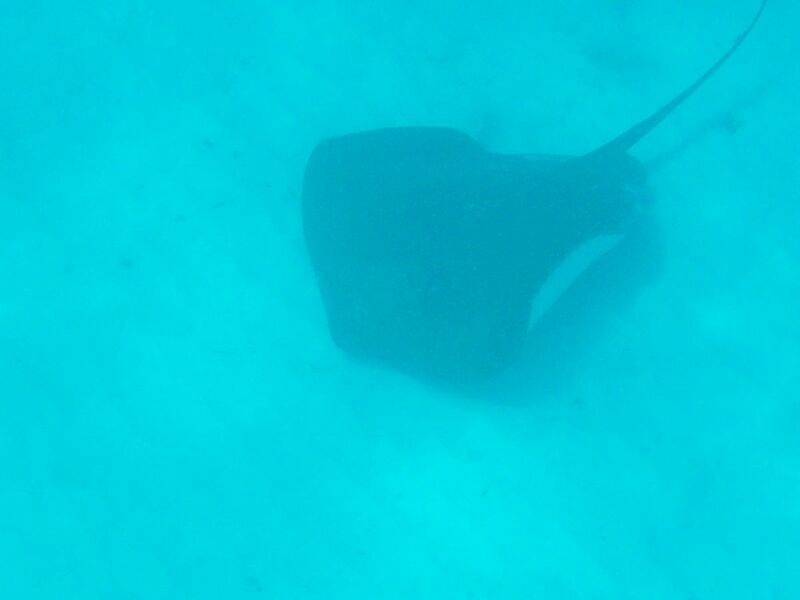 The sting rays we saw appeared to be a mother and a baby. 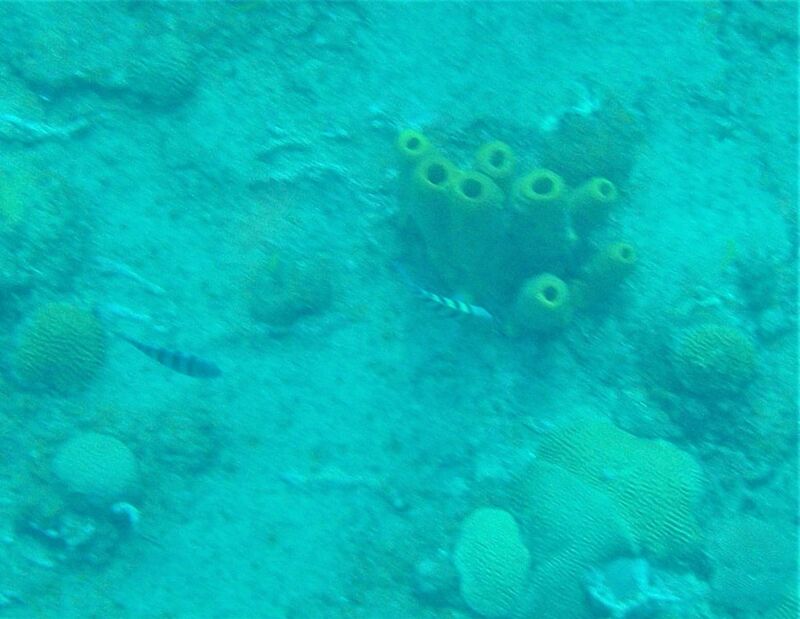 They were swimming around on the sandy ocean floor looking for food. Paddy said they are kind of like the “roombas of the sea.” The baby sting ray was bright green and zipped around much faster than it’s mother. After we had enjoyed the turtles and sting rays, we got back on the catamaran and sailed a very short ways across the bay to a shipwreck. From the boat, it just looked like a big dark shape under the water. 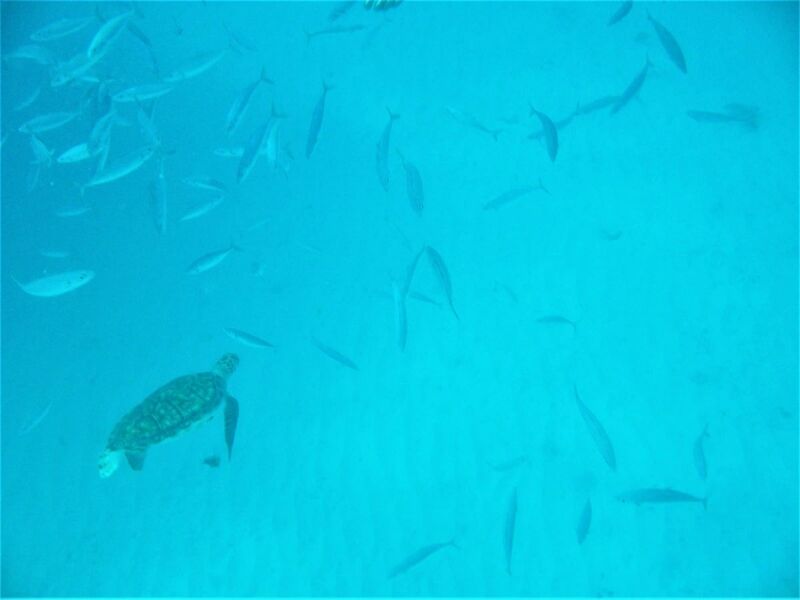 But as soon as we got in, it was right there, very close and a full marine ecosystem with lots of fish. 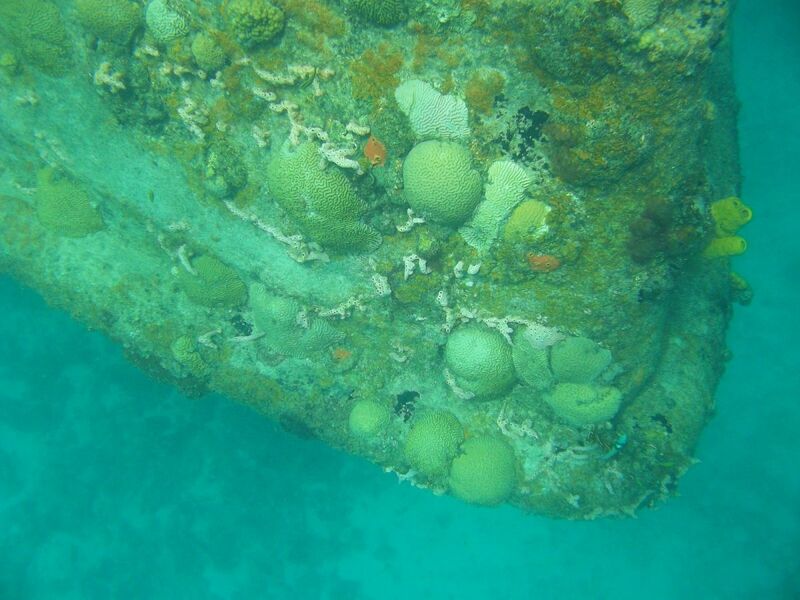 Damien and his wife told me later that they have purposefully sunk some ships recently to try and create a faux coral reef to promote new coral growth and help sustain the local marine life. 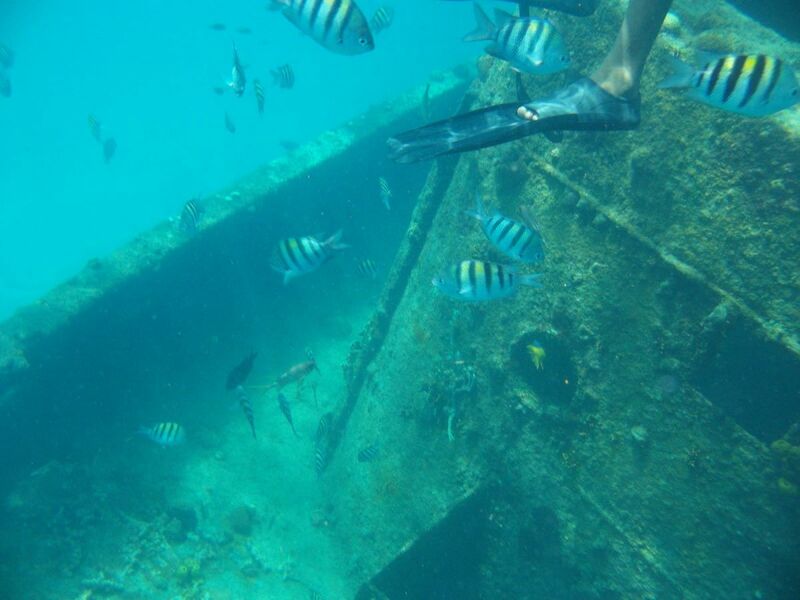 This was our first time snorkeling over shipwrecks, and it was pretty interesting. There were quite a few fish. We saw two wrecks that were right next to each other. After we finished snorkeling, we got back on the boat and I started to feel woozy. I would have liked to get off at Carlisle Bay and head back to the hotel at that point, but the rest of the tour was an hour long sail up the west coast of the island, where we would be dropped off and the rest of the group who was on the five hour tour would continue sailing and have lunch. 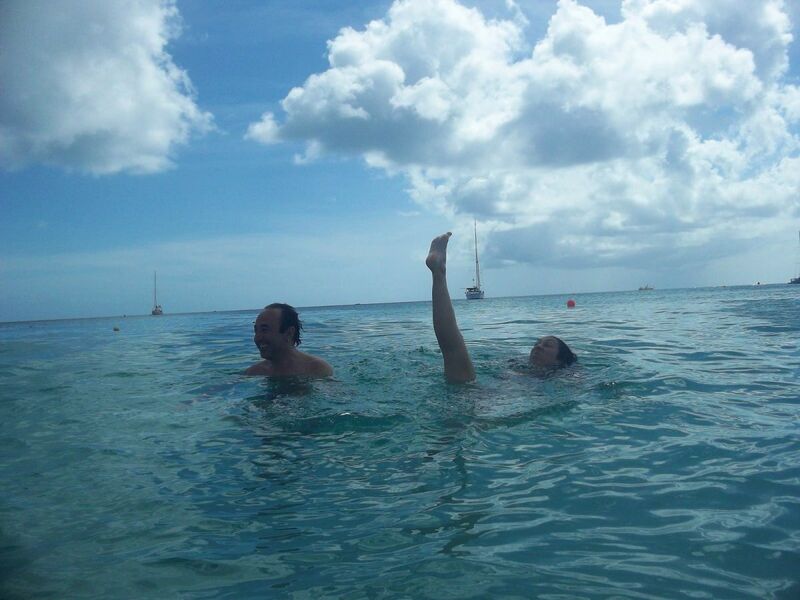 I ended up throwing up twice off the back of the catamaran while we sailed up the coast. It was not a fun way to end our adventure, but still worth it in my opinion. 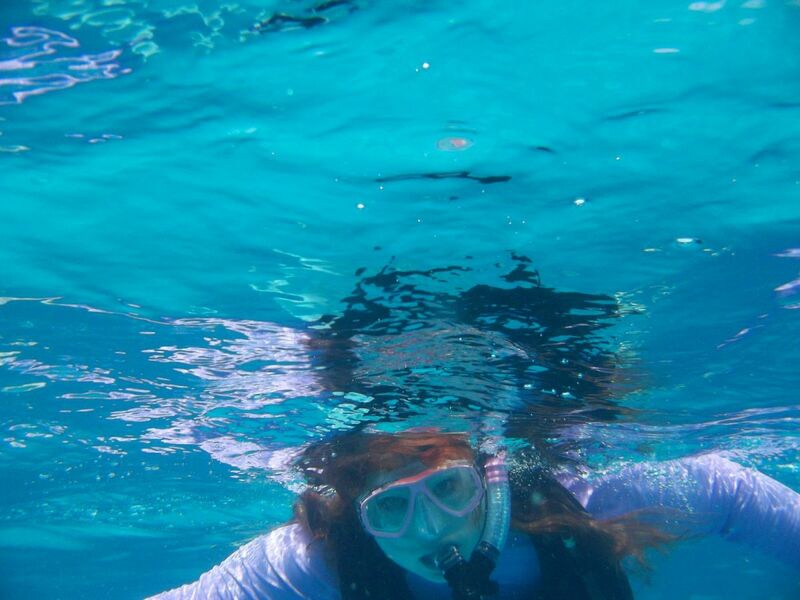 I did have a great time snorkeling and I’m glad we did it. 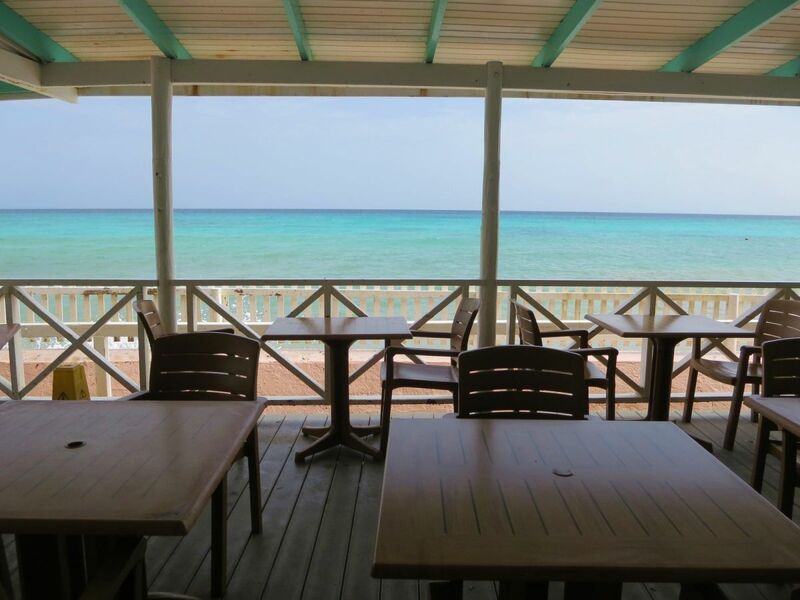 The Boatyard at Brownes Beach offers quick snorkel trips from the shore, included in the beach club price. 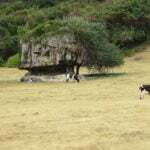 We didn’t find this out until later in our trip–see details below on day 6. Back at the hotel later that afternoon, I spent the rest of the afternoon recovering from seasickness and resting. My friend Sinem from Turkey and her boyfriend Hakan had arrived early that morning, had spent the day resting, and were ready to meet us downstairs at the hotel bar for a beer before we were all picked up for dinner by Damien. 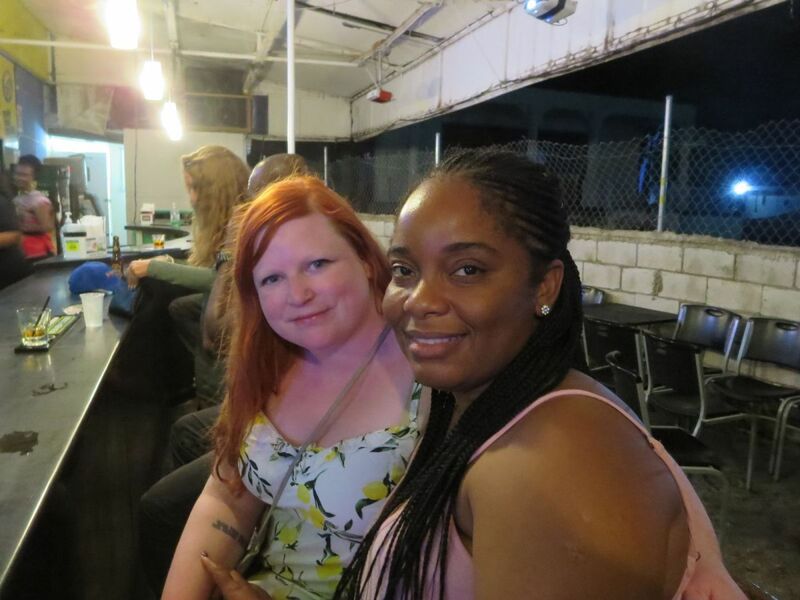 It was my first time seeing her in 20 years since our exchange year in Denmark, and it was a happy reunion. 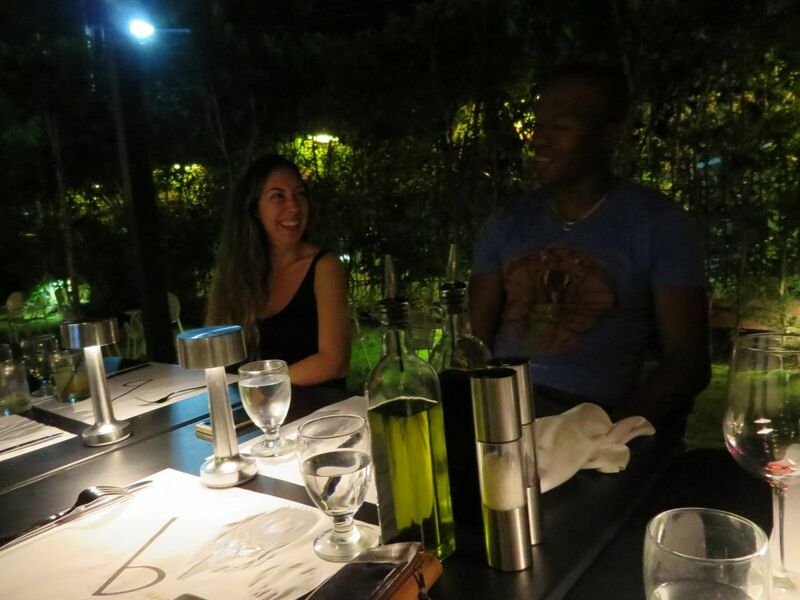 Damien took us to his favorite Italian restaurant on the island, Buzo. We met Monique and had a nice dinner catching up on the last 20 years and reminiscing about our high school year abroad in Denmark. Buzo was pretty fancy and the food was great. It is easy to rack up a large bill here, we ended up spending more here than we did at Brown Sugar. It was very nice Italian cuisine though, and the cocktails were outstanding. After dinner we ended the night with a couple drinks at Sharkey’s, a very touristy bar in St Lawrence Gap. It was pretty quiet for a Monday night, and a fun place for a nightcap. 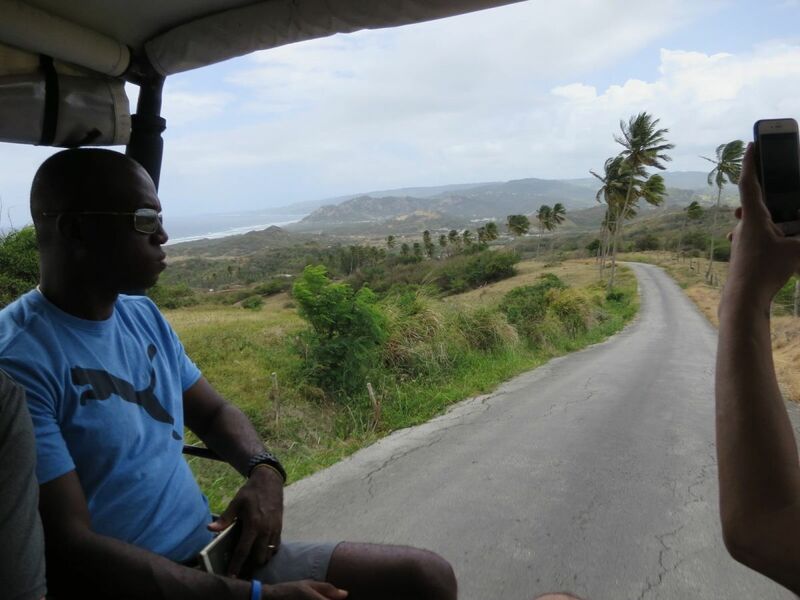 On Tuesday, Damien took part of the day off to show us some of the island. 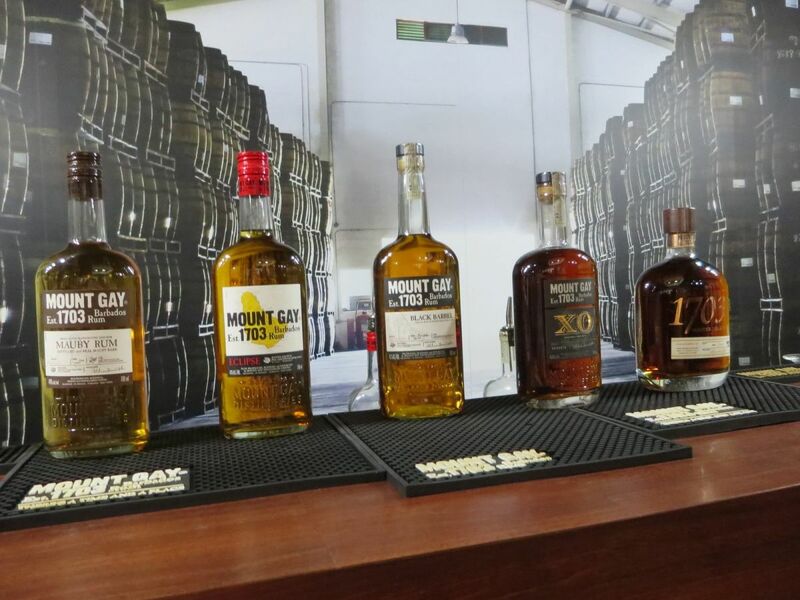 We started the day off with a rum tasting and history lesson at Mount Gay Rum. 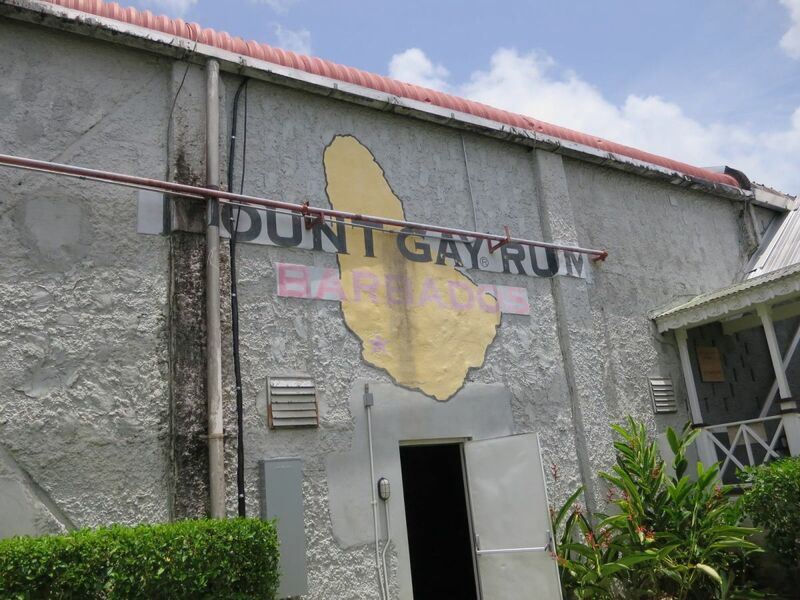 I had recently learned prior to our trip that rum originated in Barbados, and Mount Gay Rum is the oldest rum distillery still in operation, since 1703. Rum is a lot more complex than I realized. In the Pacific Northwest, rum is something you put in a mixed drink such as a mojito or rum and coke, and we don’t think much about the type of rum or where it comes from. 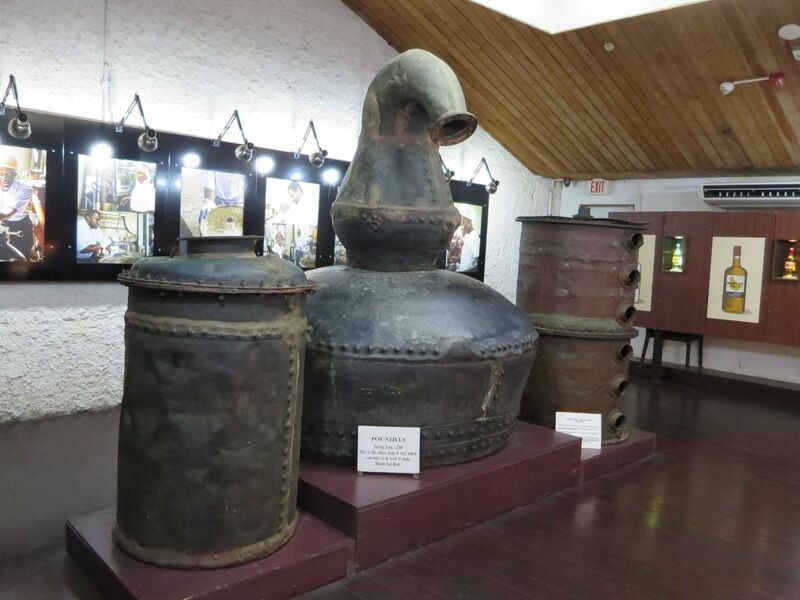 In Barbados, rum is extremely complex. There are rums made from molasses or different ranges of sugar that produce very different flavor profiles. 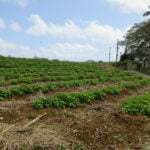 Barbados is proud of their Mount Gay Rum (as they should be), and they consume quite a bit of it–most commonly in rum punch. 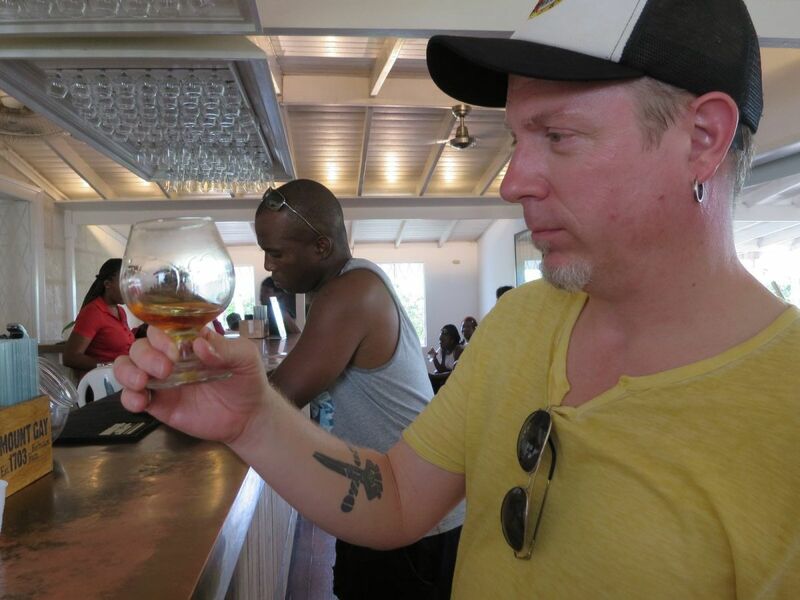 The tour was $20 per person, and included tasting three rums. The tour doesn’t actually happen at the distillery, which is located on the North end of the island, due to safety and sanitary concerns. 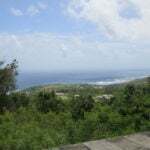 Instead we were given a short overview of rum production and a rum punch to enjoy in an air-conditioned room, and then went to a different building to watch a short film about the history of Mount Gay Rum. At the end, we were given three rums to taste in the tasting room: The Eclipse, the Black Barrel, and the XO (extra old). Our favorite was the Black Barrel, which was spicy and full bodied, able to be sipped or mixed. XO is aged longer and meant to be a sipping rum. 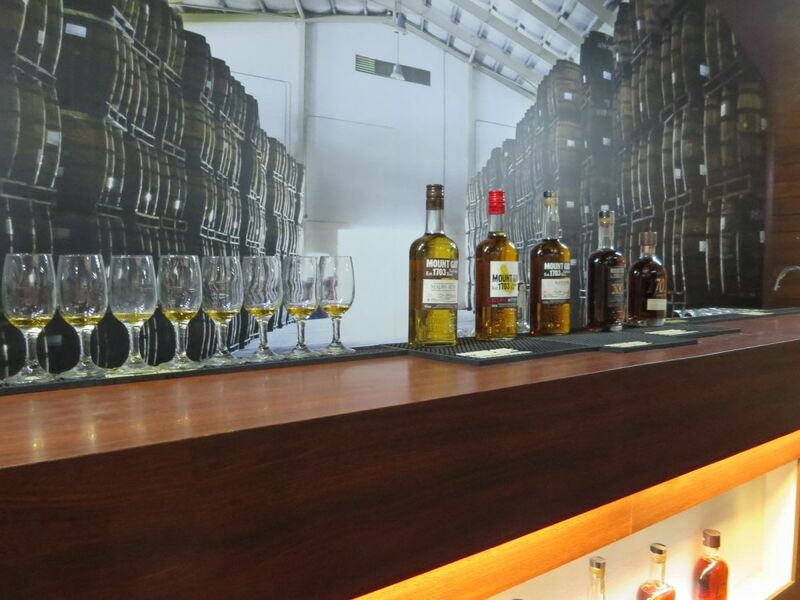 We weren’t able to taste the 1703 rum, which is the oldest and rarest variety and double-distilled and aged 10-30 years. However, for $15 we could pay for it in the bar downstairs. Paddy’s curiosity was peaked, and he went for it. It was very smooth. You can buy some delicious cocktails at the bar there, as well as bottles to take home. The prices of the bottles are a bit high though, and we found Mount Gay rum for a lot less at the local grocery store. They also sell it at many liquor stores in the US, including BevMo. After all that rum tasting we were ready for lunch. 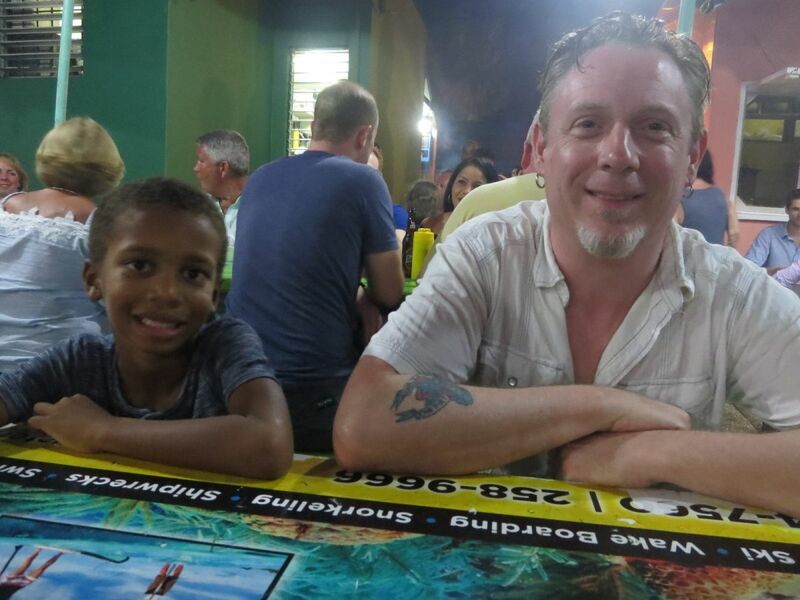 Damien took us to one of his favorite lunch spots, Rolli’s Bar and Grill in Pelican Village, where we met up with his wife and son for lunch. 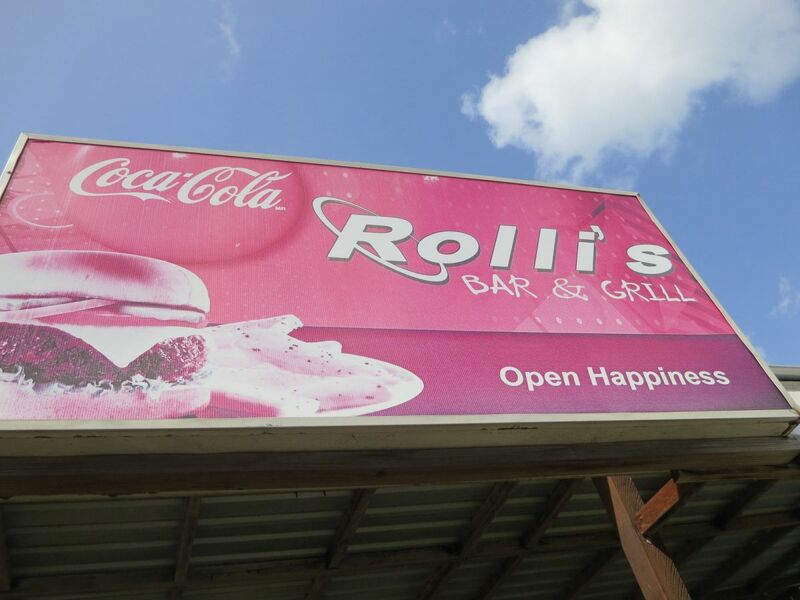 Rolli’s has an affordable menu of classic Bajan and Caribbean fare, and it was delicious. 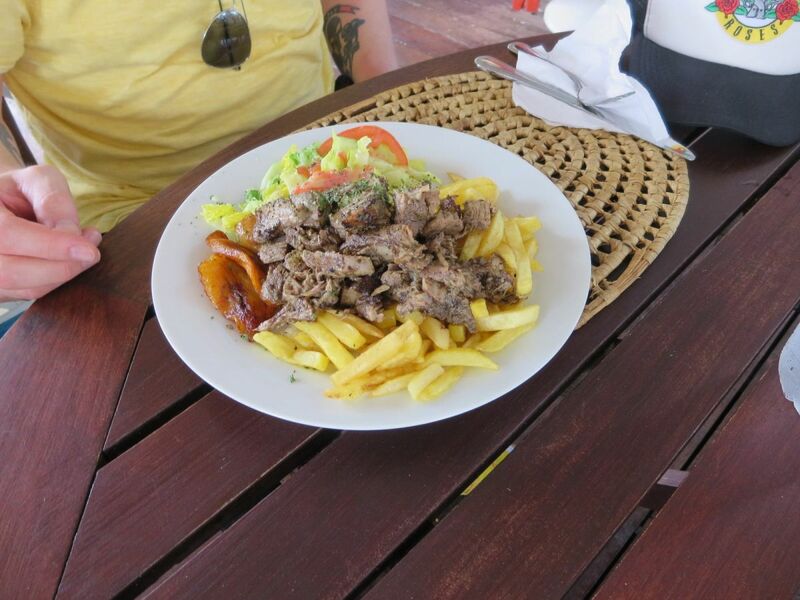 I had flying fish with potato and salad, and Paddy had pulled Caribbean jerk pork with salad and fries. Paddy’s pork dish was really tender and flavorful. 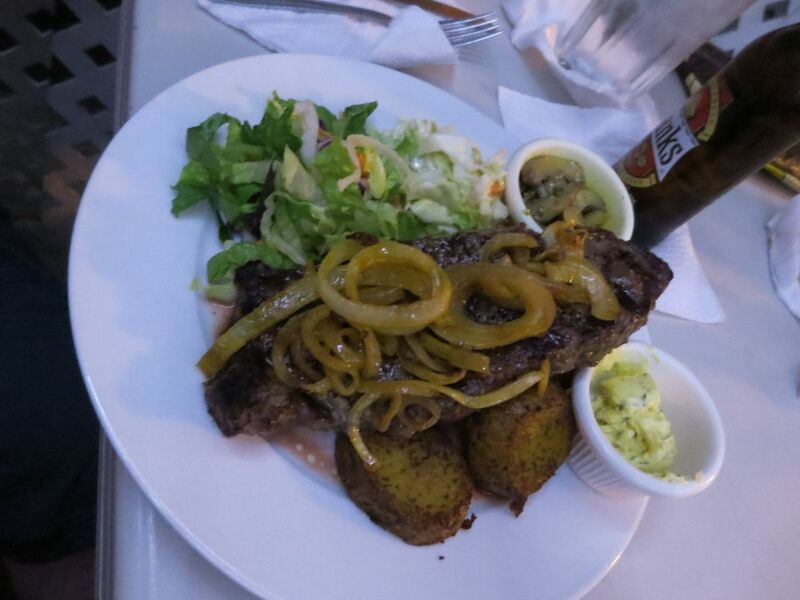 Be sure to try the Bajan pepper sauce —it is a yellowish color and on every table just about everywhere. It has mustard and turmeric and a fantastic unique flavor. We stocked up on this sauce at the grocery store before we flew home. It is delicious on fried flying fish. 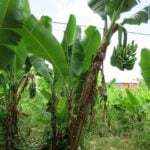 You can get different varieties but the standard yellow one is fairly mild. After lunch it was beach time. 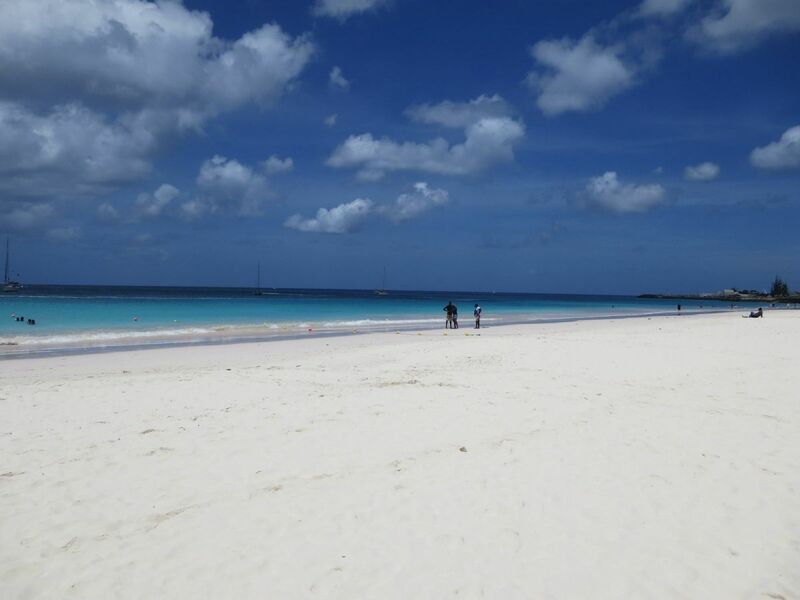 The best beaches in Barbados for swimming are on the West Coast. 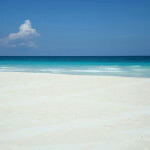 The sea is calmer and the sand is powdery white. 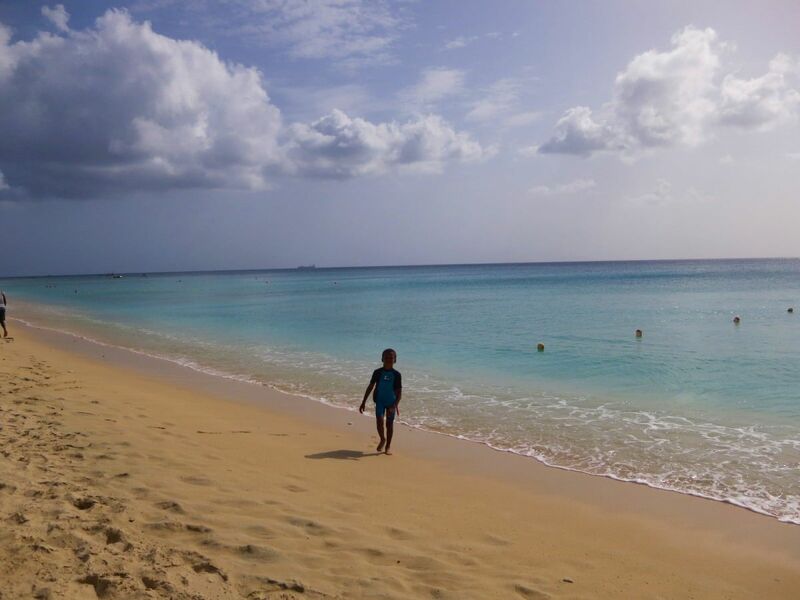 Damien took us to Sandy Lane Beach, where we parked across the street from Rihanna’s house (!!) and used the beach access next to her property. 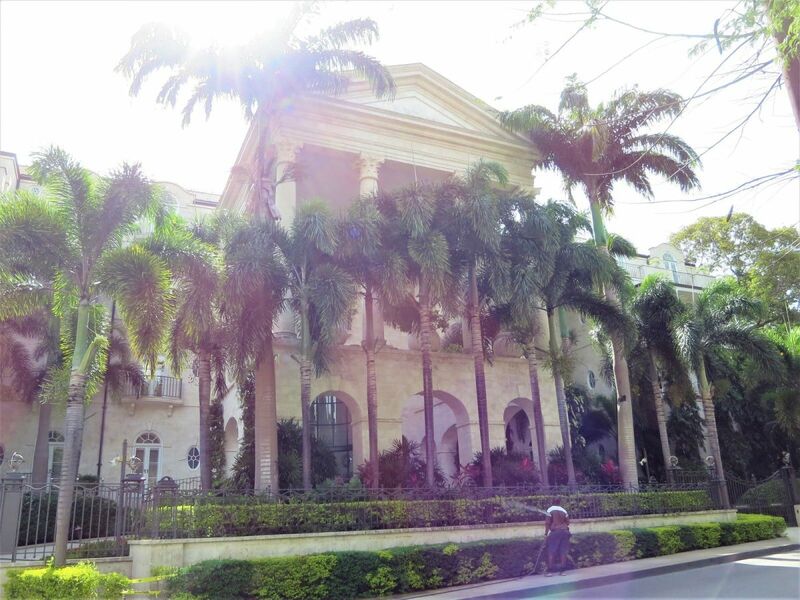 Technically, this giant mansion isn’t all Rihanna’s house. It is comprised of six apartments, the other five of which are owned by other rich and/or famous people as well. 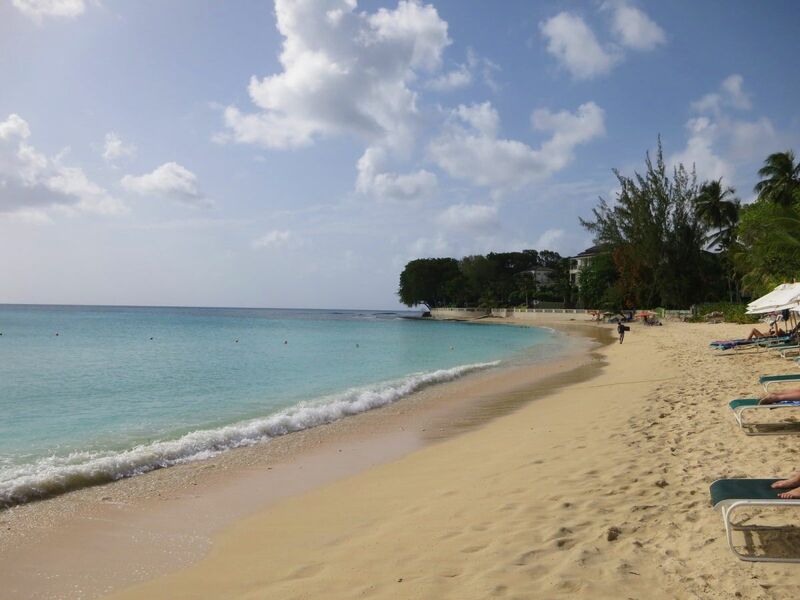 Sandy Lane Beach is where the fancy people swim. Lots of private houses and B&Bs and fancy hotels. It isn’t a huge beach but looks kind of exclusive. We tried to set up our towels in one spot only to have the owner come out and tell us we had to move. We found a spot nearby—but be prepared for snobbery to the general public if you visit this beach. The shore is a tiny bit rocky at first, but drops off pretty quickly to soft sand. It wasn’t the best beach for kids because it gets shoulder to neck deep on adults very close off the shore. The water felt really good. By the time we got back to our hotel on the South Shore that evening, it was about 7:00 and we were salty, sandy, and hungry. We quickly showered and changed and went with Sinem and Hakan in search of sustenance nearby. Just a block or two up the road we found Breezer’s Bar & Grill, a local spot serving British pub food and blaring hits of the 80’s. 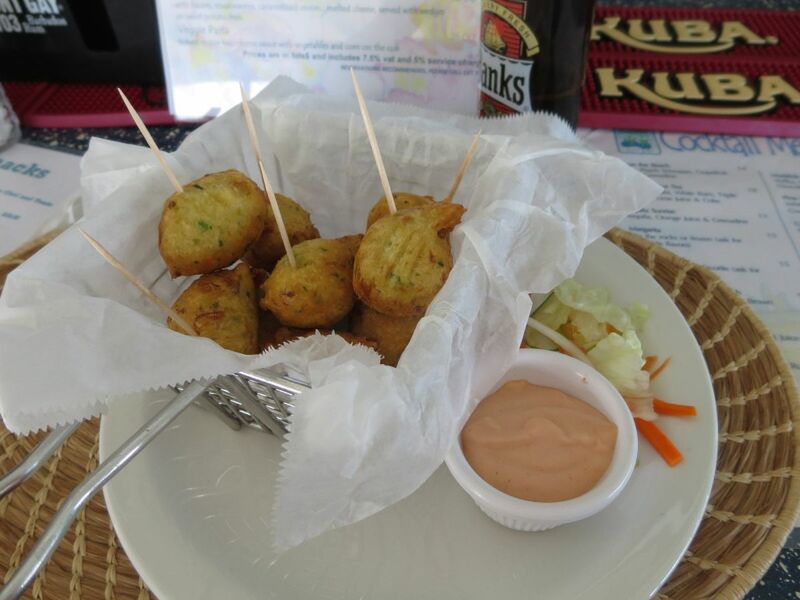 We sat outside and had some Banks beers and pub food, as well as a shared appetizer of Bajan fish cakes. It was casual and the food was great. 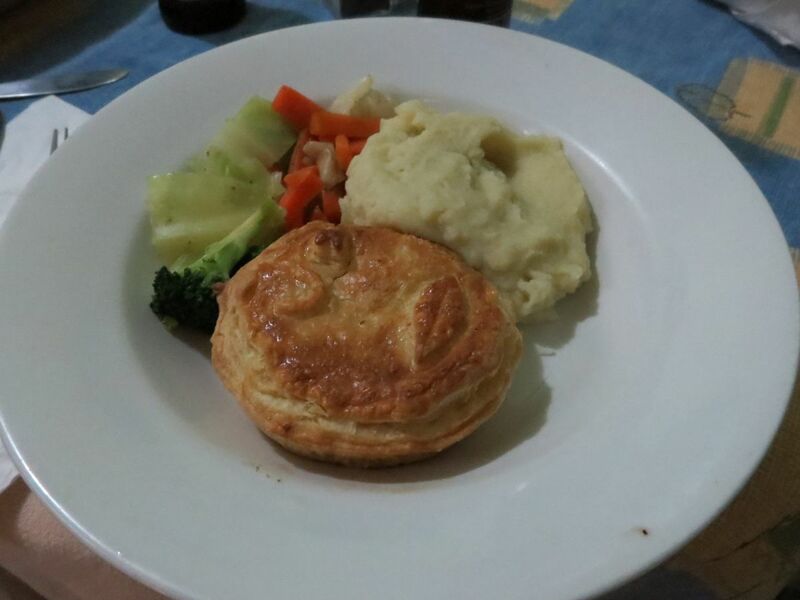 Paddy had a curry dish that he really enjoyed, I tried a chicken mushroom pot pie with mashed potatoes and veggies. The prices were very reasonable. Wednesday was Safari Tour day. Both Damien and Monique said we absolutely HAD to do an island safari tour while we were here, and they came along on the tour for the day as well. 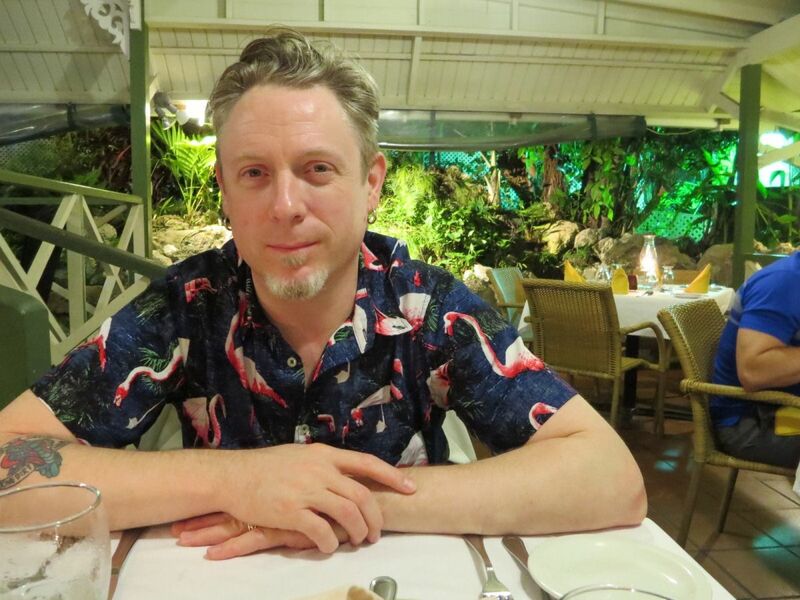 Damien made a group reservation for us with Island Safari Barbados, and they picked us up at the hotel in the morning. 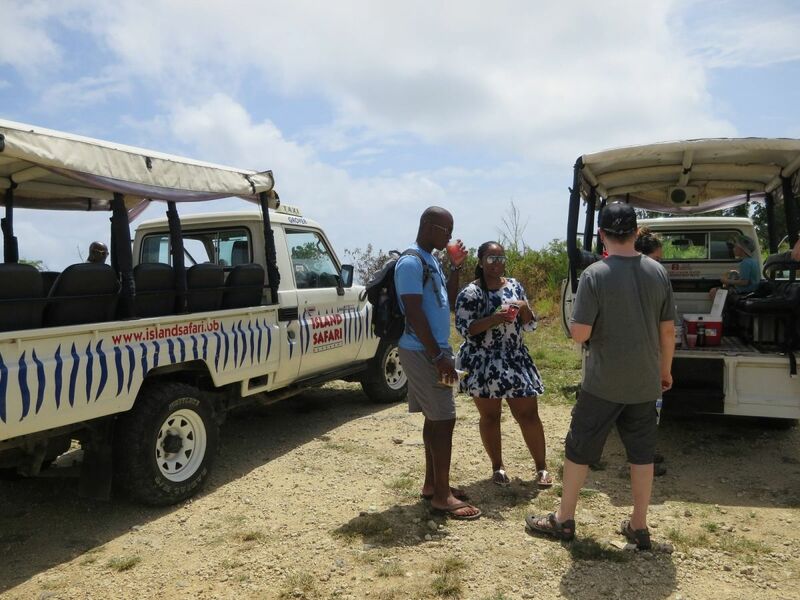 We did the Adventure Safari, which was $98.00 USD per person, and includes a five hour tour of the island, hotel pick up and drop off, and a buffet lunch with alcoholic and non-alcoholic beverages. 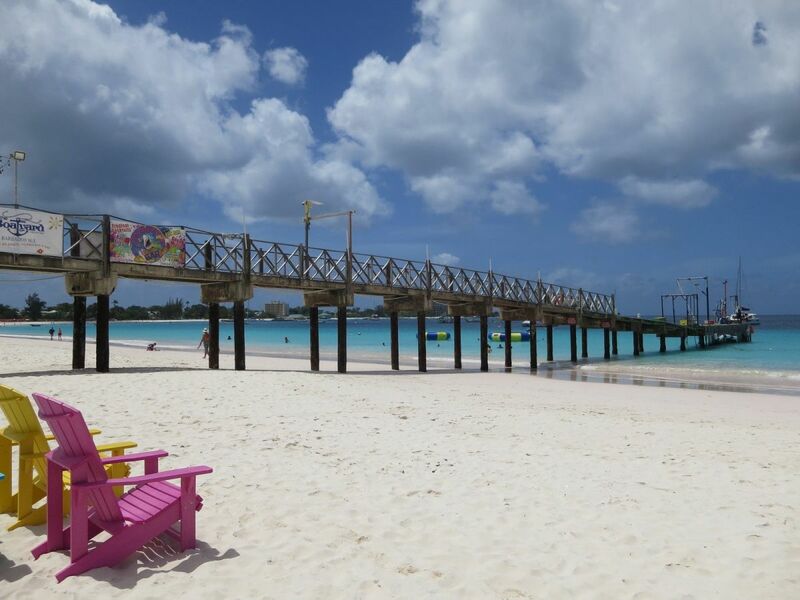 There aren’t many countries that you can see all in one day, but Barbados is one of them. 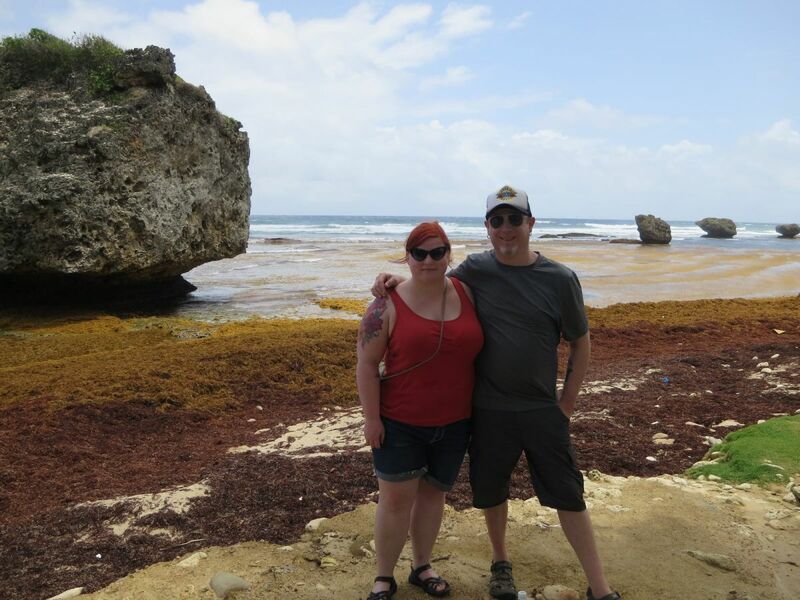 We drove all around the island and saw many sights and viewpoints, with stops for photo ops and rum punch. 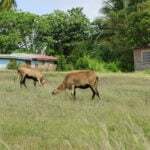 The safari tour ended with a Bajan buffet lunch, including chicken, flying fish, macaroni pie, peas and rice, salad, and desserts. Wine and beer are included as well. That evening Sinem and Hakan were too tired and jet lagged to go out, so we decided to see what Oistin’s was all about down the road. Oistin’s is a small south shore town where the fishermen bring in and clean their fish, known most notoriously for their Fish Fry every Friday night. All the vendors are open on Fridays and it turns into a big street party with locals and tourists alike. On a Wednesday, it was pretty quiet. 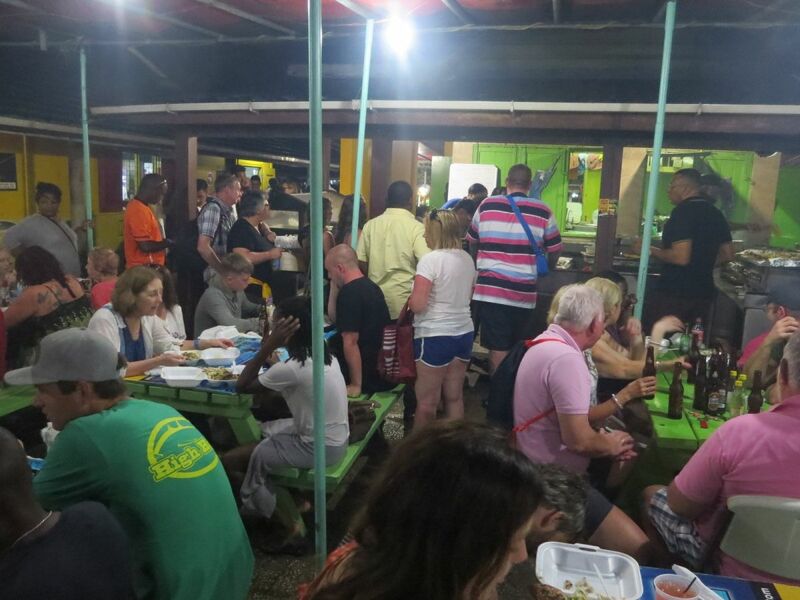 A lot of food stalls were closed but quite a few were open, serving different varieties of grilled and fried fish and Bajan dishes. We were hustled into Pat’s Place by a woman with menus pulling people in off the sidewalk. We took a look around at the other stalls, and then decided Pat’s Place looked just as good as any other, and there was plenty of open seating. 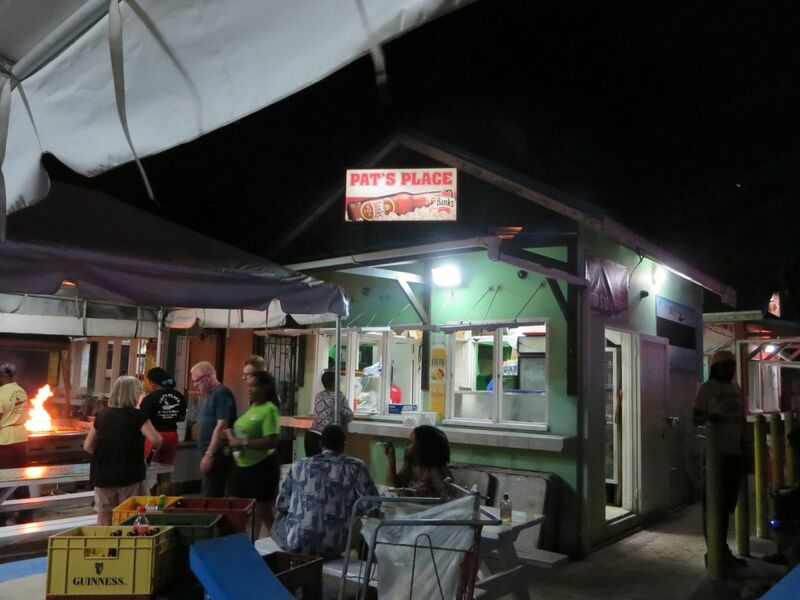 Pat’s Place, Oistins Barbados: Kingfish, coleslaw, grilled potato, and macaroni pie. There was table service, and our agressive but friendly street hustler/server brought us some Banks beers and took our order. For $15 USD we could order a meat or fish and three sides. We decided to order some different things and share. 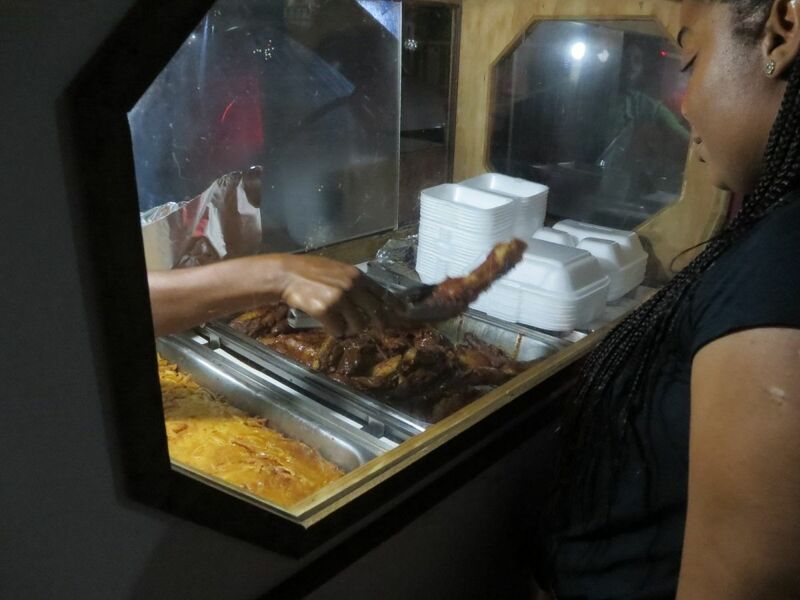 I ordered fried chicken with peas and rice, macaroni pie, and breadfruit, and Paddy ordered kingfish with grilled potato, coleslaw, and macaroni pie. Holy huge portions, Batman! We easily could have shared one dinner between the two of us. Fortunately our hotel room came with a fridge, so I ended up eating the leftovers for breakfast for the next two mornings. The kingfish was grilled in a flavorful sauce, and the macaroni pie was delicious. Macaroni pie is pretty much like macaroni and cheese in casserole-form, with a bit more tomato flavor and spices mixed in than just cheese. Everything was fantastic. It was some of the best food we had our whole trip. 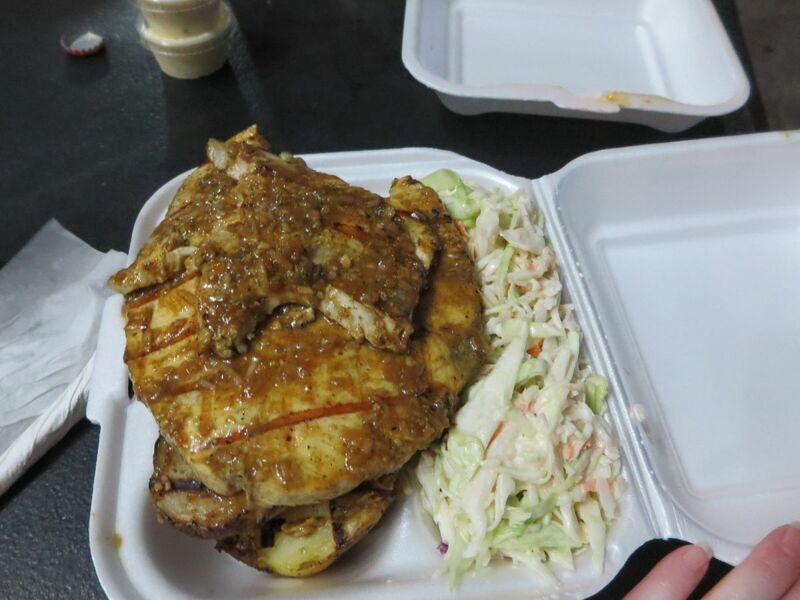 If you want real local Bajan food, go to Oistins. If you’re on a budget, two people can easily share one $15 dinner. 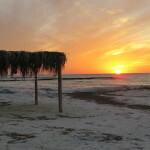 Thursday was Sinem and Hakan’s last day, and both Sinem and I wanted some more relaxing beach time before heading home. 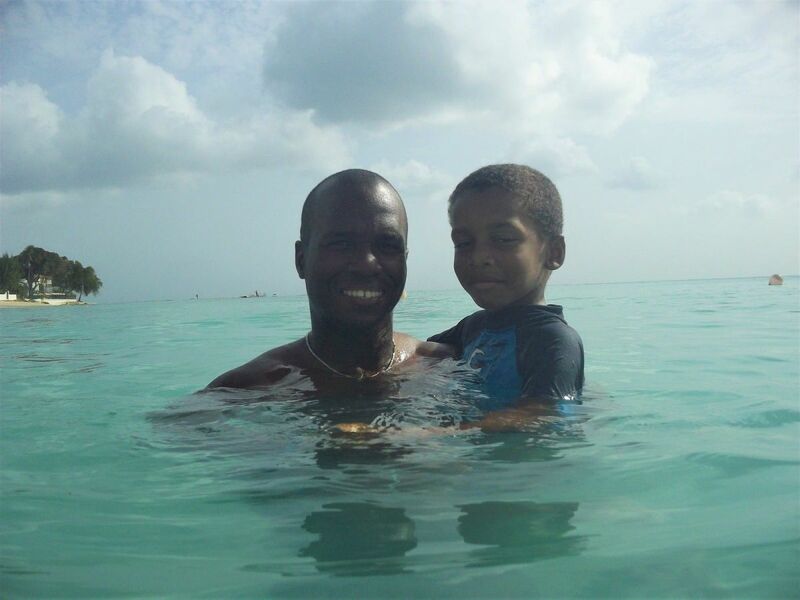 Damien suggested The Boatyard, a beach club on Brownes Beach, which is the best beach on the island. 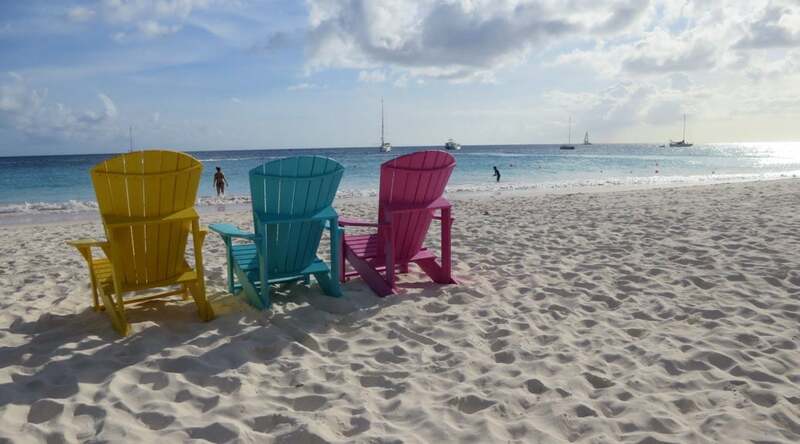 Extremely touristy, but $25.00 USD per person includes a beach chair and umbrella for the day, bathrooms and showers, and $20 credit towards food and drinks at the bar. A sun umbrella is essential for Paddy and I with our fair skin, and I wanted to relax somewhere with amenities like food and drinks and changing rooms. 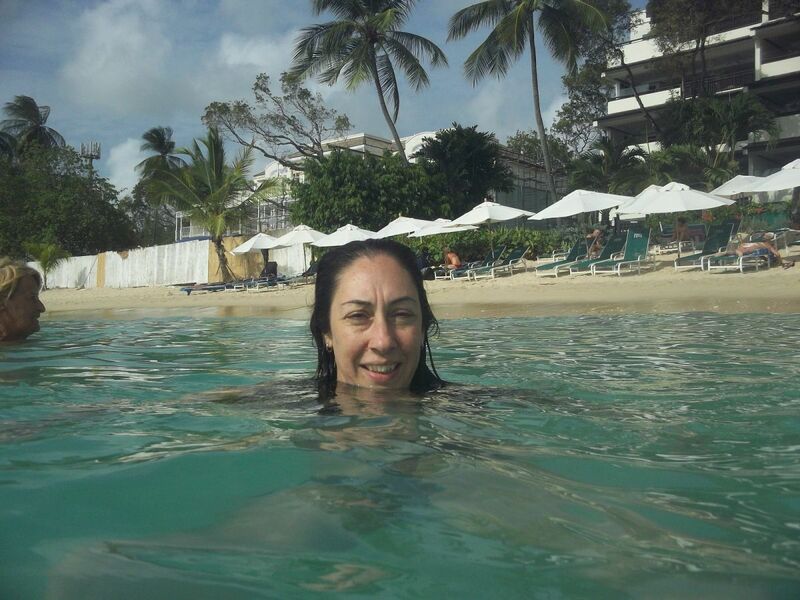 Also, the Boatyard offers free snorkel trips out to the bay a few times during the day. Just sign up for a time after you pay your entrance fee. 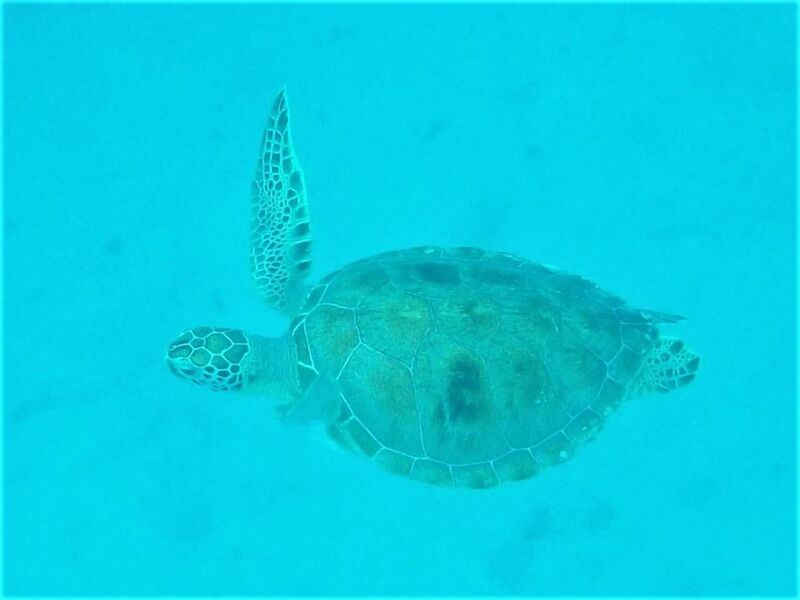 These are quick trips right to the shipwrecks and sea turtles in Carlisle Bay from the dock at the boatyard, so there is very little time spent on the boat. Had I known this before, this definitely would have been the best option for me with my seasickness issues. 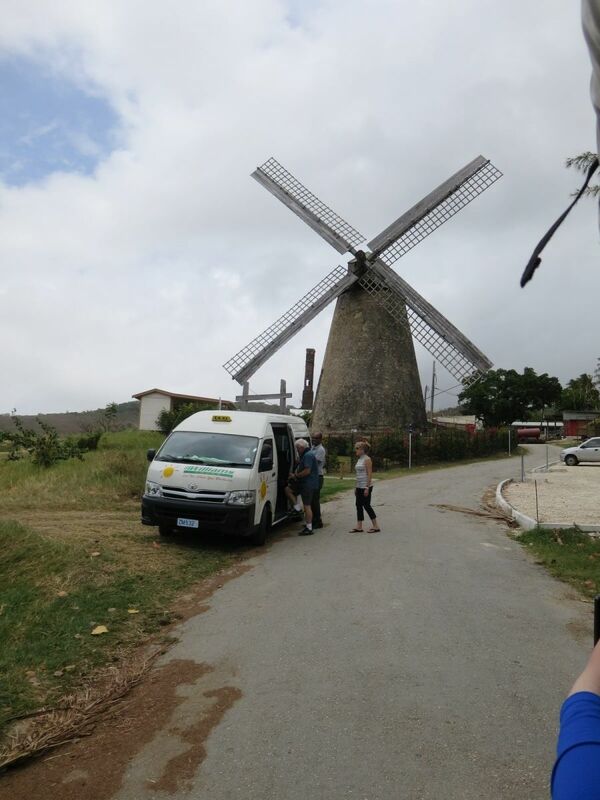 We took the local van shuttles, which is the best way to get around if you don’t have a car. 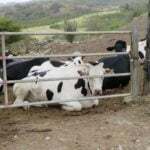 They come down the road about every 2 minutes, and you can just wave at one to flag it down. You pay $2.00 BBD when you exit, just tell the driver where you are going and he or she will stop at the closest place on their route. 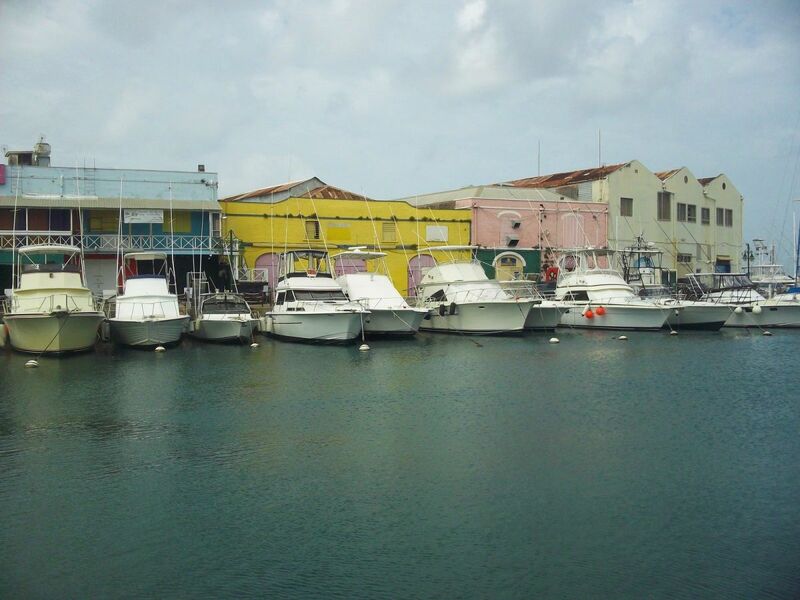 The Boatyard is very close to downtown Bridgetown, and Paddy wanted to check out the city. While we set up to relax on the beach, he went for a walk around town. He came back after a couple hours saying he saw a lot of tourist shops, and when he tried to get off the main drag people thought he was lost or trying to buy weed. 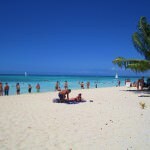 According to our local friends, Brownes Beach is the best beach on the island, and I would have to say that it must be. The powdered sugar sand was so soft and there was hardly any coral or rocks in the water. 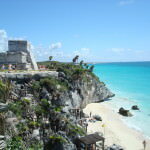 The only other beaches I’ve been to so far that compare are the ones on the Yucatan Peninsula in Mexico: Tulum and Isla Mujeres. 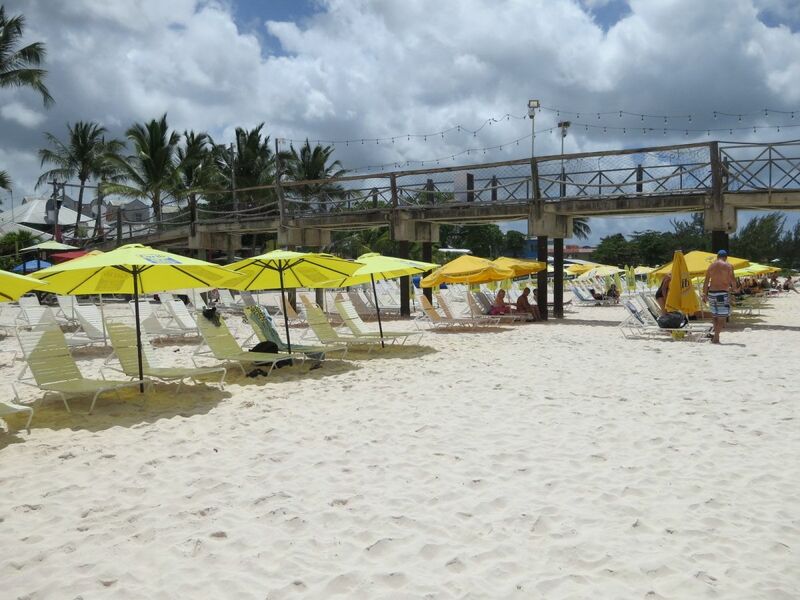 The beach is very long, with the north end being more for tourists as it is closest to the cruise ship pier, and the south end being a bit more of a locals beach. I think we were the only people at the Boatyard who weren’t off a cruise ship. It was REALLY touristy, and the party music (UB40 anyone?) was a little obnoxious, but the beach was so beautiful I was able to tune it out. Paddy had a more difficult time with it. 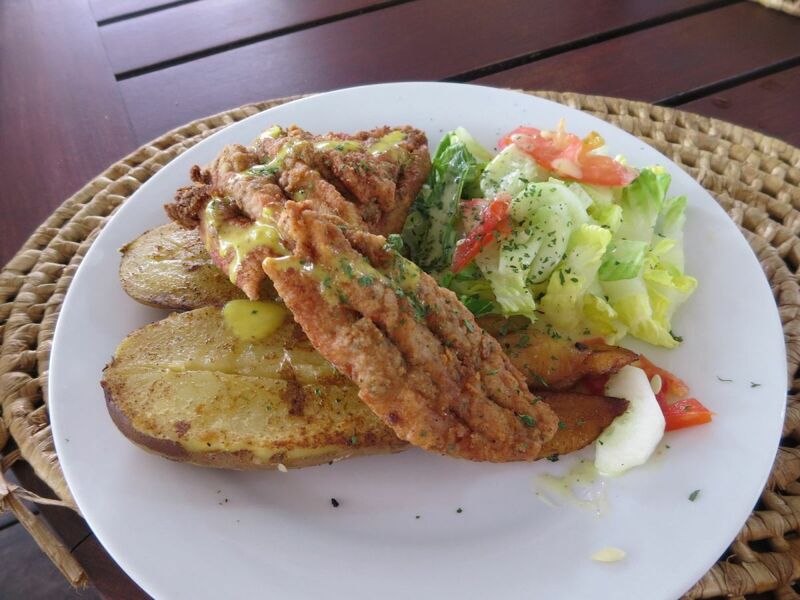 For lunch I had a fish sandwich (or “cutter” as they are called in Barbados). It was good, and reasonably priced. There were two for one cocktail specials going on so we ended up getting a few drinks and lunch for me (Paddy wasn’t hungry) and didn’t end up using more than the total $40 USD worth of food and drink included in our entrance fee. There were one or two times where “free shots” were offered to whoever wanted them, during which a really obnoxious song about shots was blared and the bartenders got up on the bar and poured bright colored liquids into people’s mouths. Sinem and Hakan went for it just for fun. I don’t know what was in those bottles, but I didn’t think that neon high-fructose corn syrup with a tiny bit of alcohol needed to be in my body, so I opted out. Damien and his son Dimitri joined us for a bit in the afternoon, and we stayed until closing around 5:00 PM. 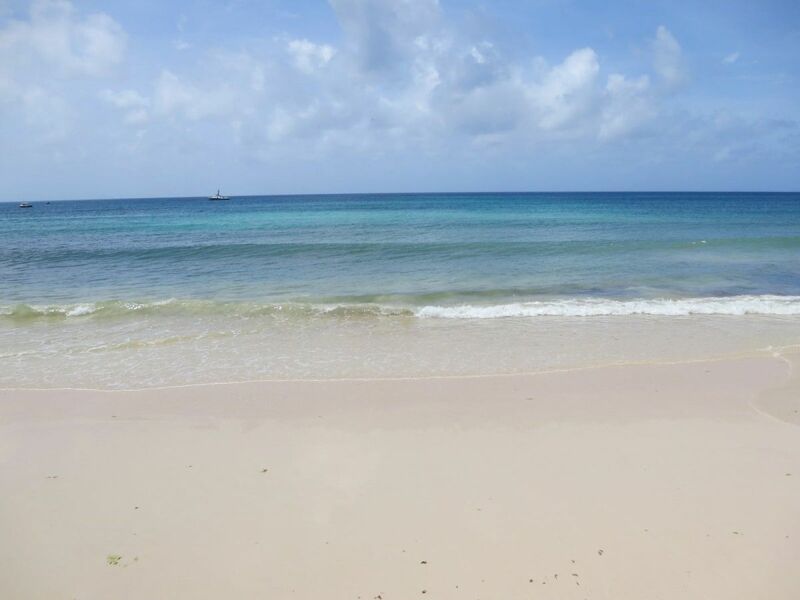 It was a good day and I would definitely make Brownes Beach a top priority when visiting Barbados. 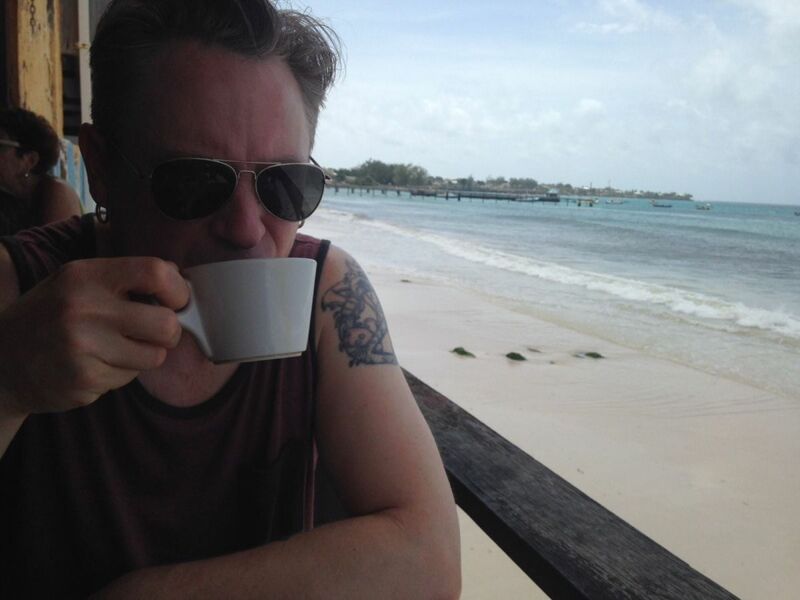 If beach chairs and amenities aren’t a priority and you can’t handle cruise ship tourist free-shot UB40 time, head further south down the beach for a more local experience. That evening, we went back to Shaker’s for dinner again, as Sinem and Hakan hadn’t been there yet and it was their last night before heading back to Turkey. Damien’s wife and son met up with us for dinner and we had a nice evening. 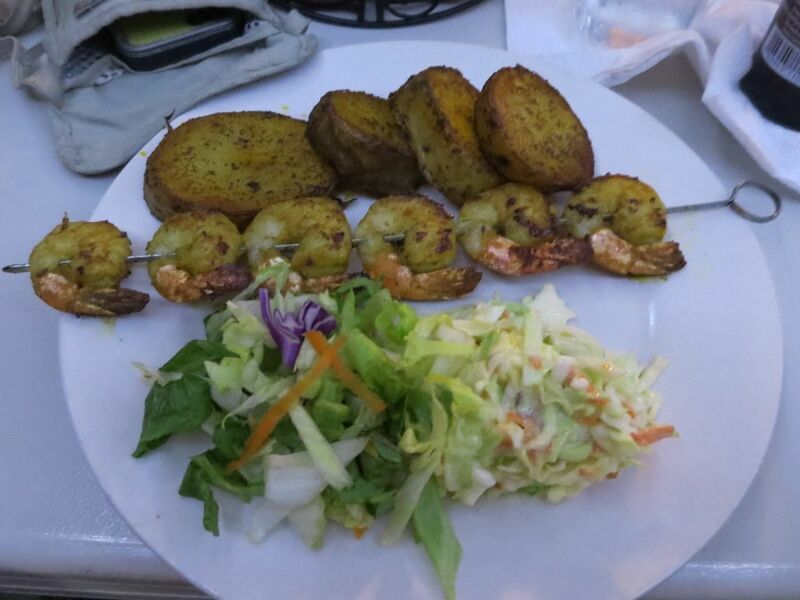 This time Paddy tried the steak and I dried the grilled shrimp. 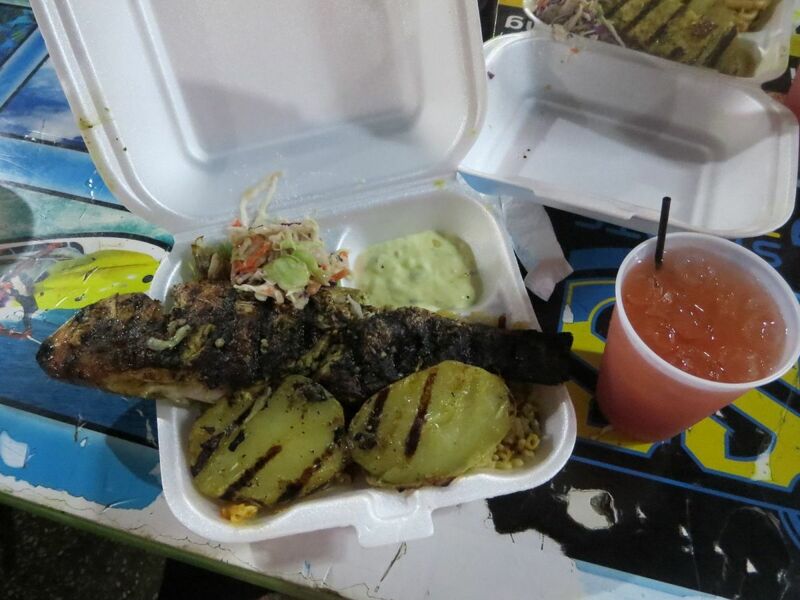 The shrimp were good, but I liked the blackened lionfish I had the first night better. After dinner we went out for a few drinks in St Lawrence Gap, where Monique joined us. We started off with some upscale cocktails at Cocktail Kitchen. The cocktails were a bit pricey, but delicious. 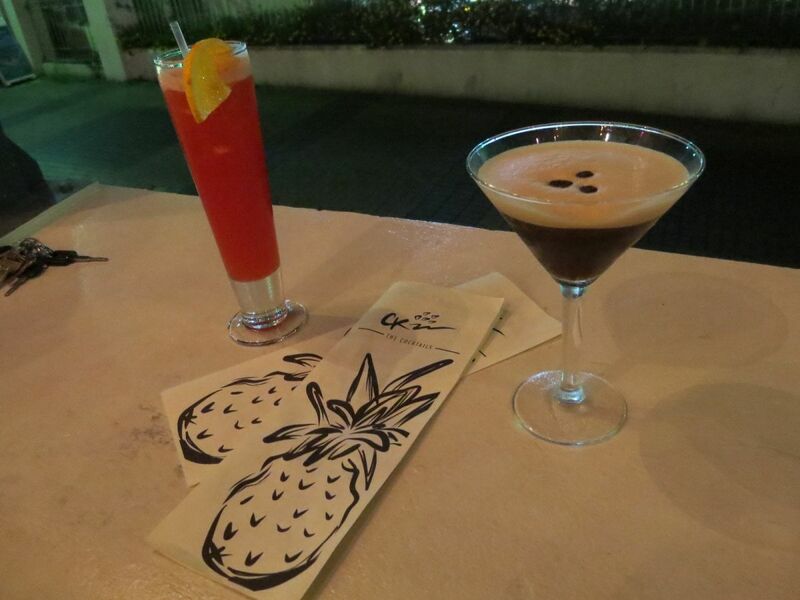 I felt like I needed a little kick along with my drink, so I had the Espresso Martini. The espresso shot and the vodka made the drink just the after dinner pick me up that I was looking for, and tasted like dessert. 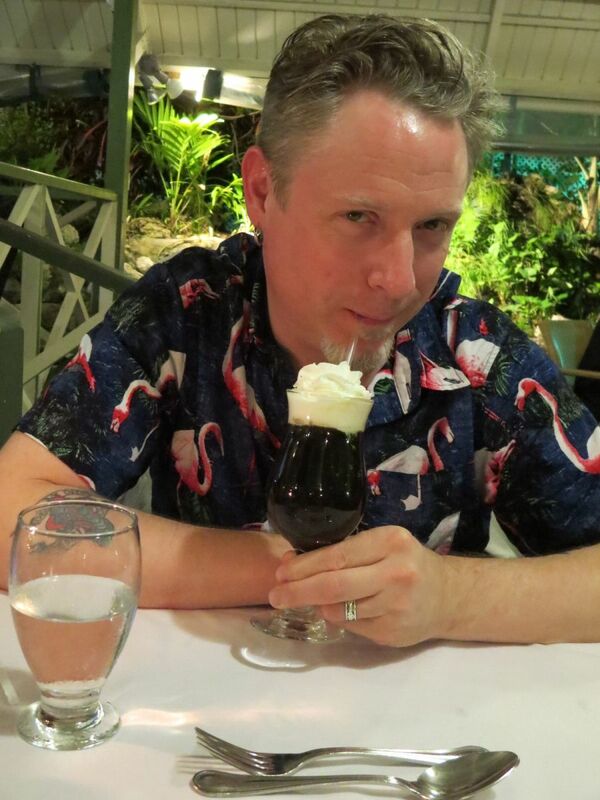 Damien had the classic Zombie tiki drink, made with Mount Gay black barrel and silver rums. He said it was good. After starting with a few nice cocktails, we stopped back off at Damien’s favorite bar (Hal’s Bar) again for some beers. It was busy with locals getting their Thursday night on. We had a few drinks and celebrated Sinem and Hakan’s last night. 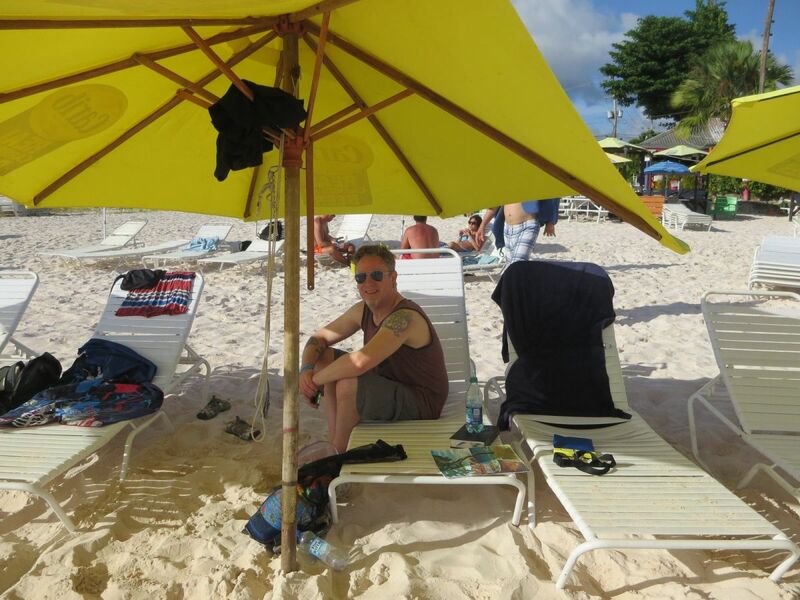 Our last day in Barbados, we took it easy. We had a mediocre breakfast at the hotel (the breakfast buffet isn’t that great at Butterfly, but we didn’t feel like going anywhere else). We walked down to the Massy grocery store to pick up some rum, jerk seasonings, and Bajan pepper sauce to take home. We then packed, read books, and lounged by the pool. 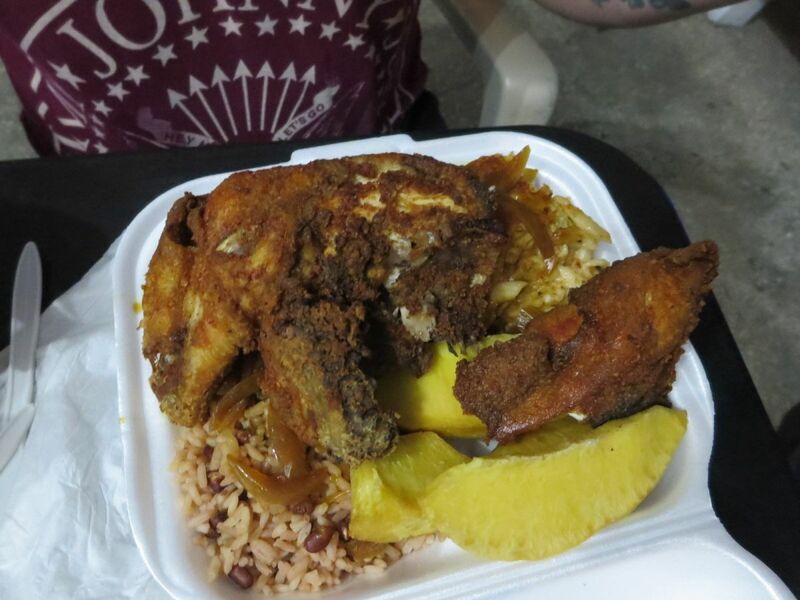 That evening, Damien picked us up and took us to the Oistin’s Fish Fry, a Friday night tradition in Barbados. 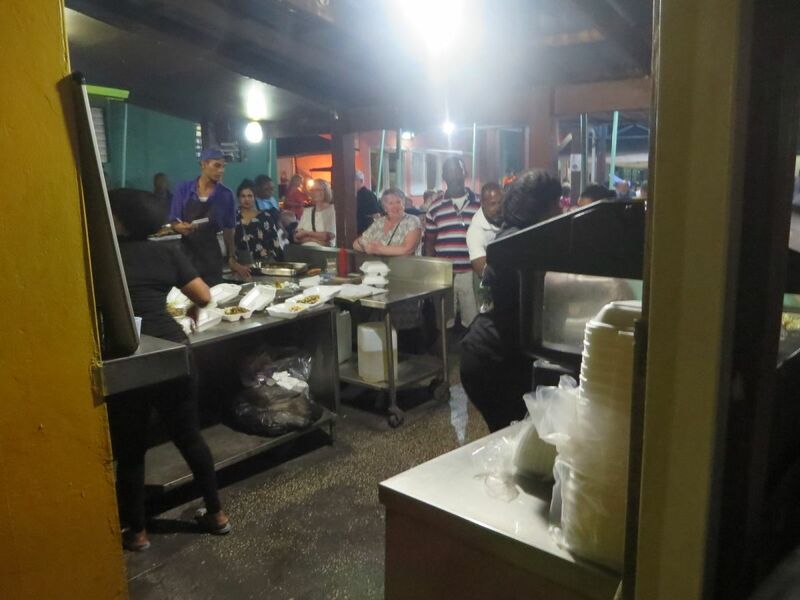 If you are in Barbados on a Friday, you MUST go to the Fish Fry. 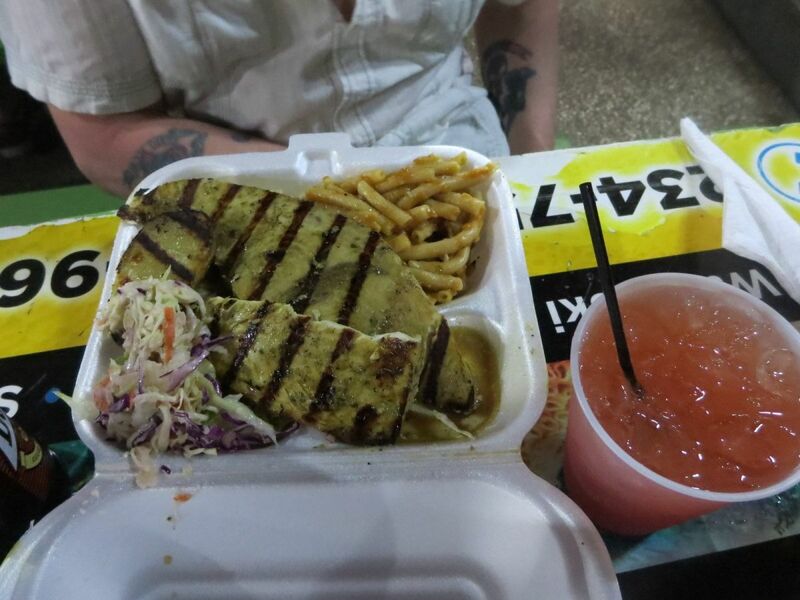 It’s a great way to get a full dose of Bajan food and culture all in one. The Fish Fry was BUSY. Traffic on the main road was bad so Damien took a back hills secret-squirrel route. Parking wasn’t too hard to find in the lot across the street, but it was filling up fast. We weaved through the food stalls and stands selling souvenirs and crafts until we got to Damien’s favorite fish stand, Uncle George’s Fish Net Grill, where there was a line. The line didn’t seem that long, but it wasn’t moving very fast. Damien got us some beers from a rum shop next door to drink while we waited. Of course, it started pouring rain while we were in line. We ducked under the overhang of the rum shop for a bit, but had to jump back in to claim our spots once the rain got back down to a drizzle. Uncle George’s was selling all kinds of fish. You chose your fish and it comes with a couple sides: macaroni salad, peas and rice, coleslaw, fries, or potato. The line took about an hour (good food takes time I suppose) but it was worth it. Once we had placed our orders, we realized we had a conundrum–where to sit. The place was packed. We finally saw some people getting up to leave so we gave Damien our money and went with his son Dimitri to hold the table while Damien waited for the food. 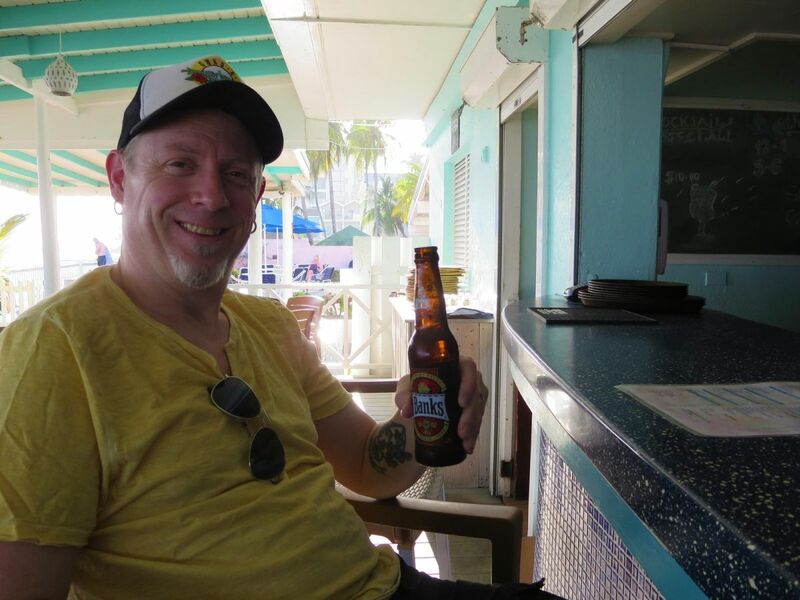 Paddy got another beer and a rum punch from the rum shop –the rum punch was STRONG. Delicious, but I couldn’t finish it as I didn’t want to be hungover for our 6:00 AM flight the next morning. Monique joined us and after we ate we watched some of the dancers on the stage for a bit. The first three weren’t that great, but then a Michael Jackson duo started up and they were fabulous. One was doing an 80’s Michael impersonation and the other was 90’s Michael. Their dance moves and facial expressions were spot on. 80’s Michael was my favorite. We wanted to stay late but we had an early flight the next morning. 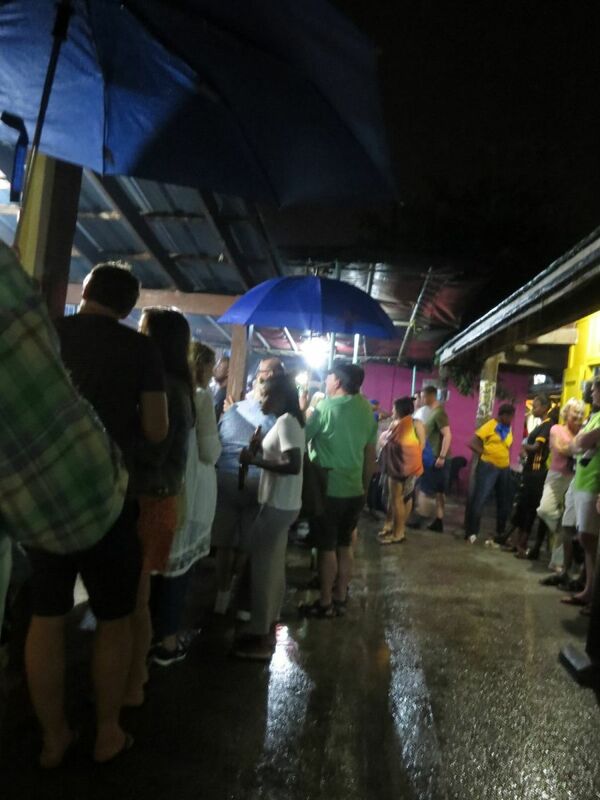 If you go to Barbados, try to make a point to arrange for a Friday night at Oistins. It was pretty fun. 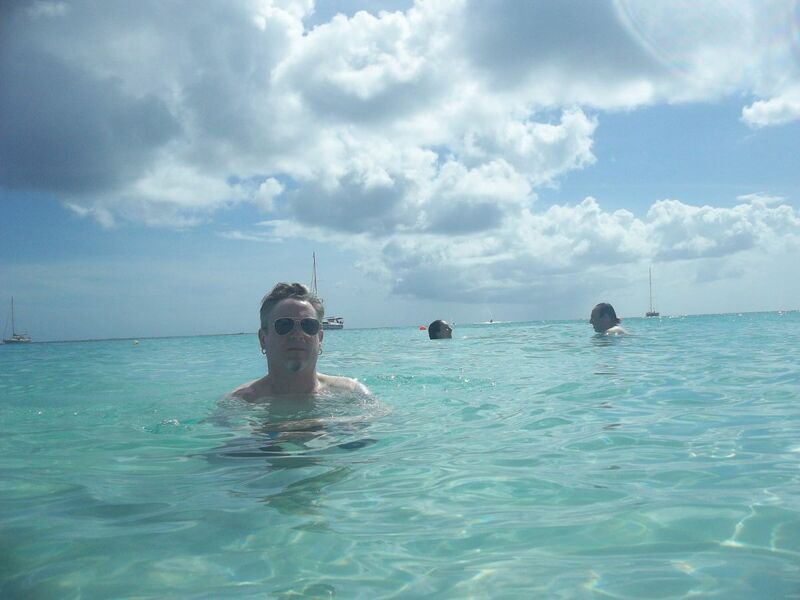 Barbados is a beautiful country. 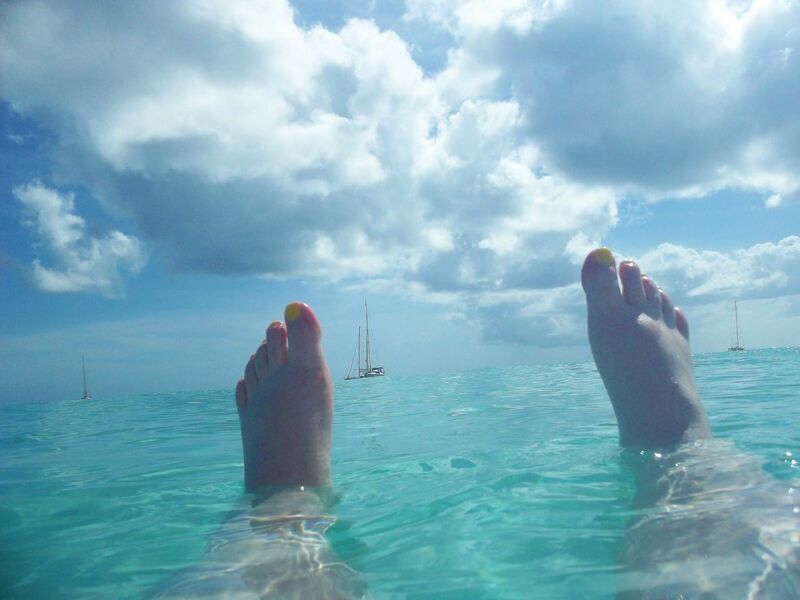 A lot of people only see it for a day on a cruise ship stop, or spend most of their time at a mega resort. There is a lot more to see away from the tourist trail, but some of the touristy things are still pretty fun. 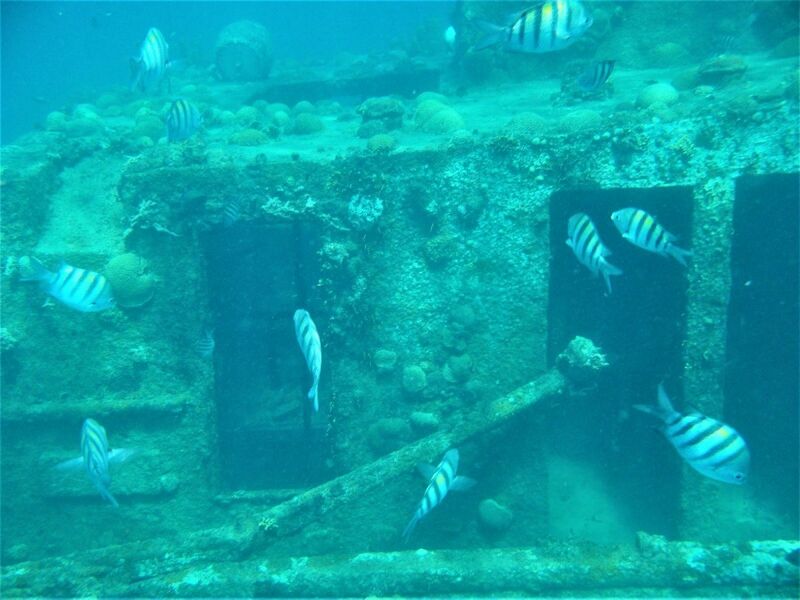 We would definitely recommend the island safari as a great way to see the country, Oistins Fish Fry, and snorkeling with turtles and shipwrecks. The best beaches are on the west coast, but staying there can be pretty pricey. 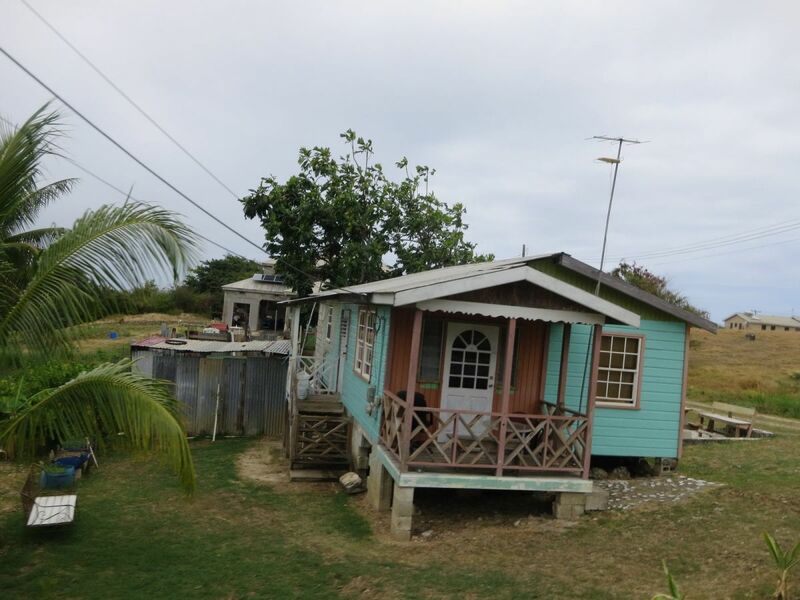 We liked staying near Oistins and being able to walk to a grocery store and good local food. It was great to see my long lost exchange student friends again, and we felt fortunate to have local guides to show us what they love about their country. 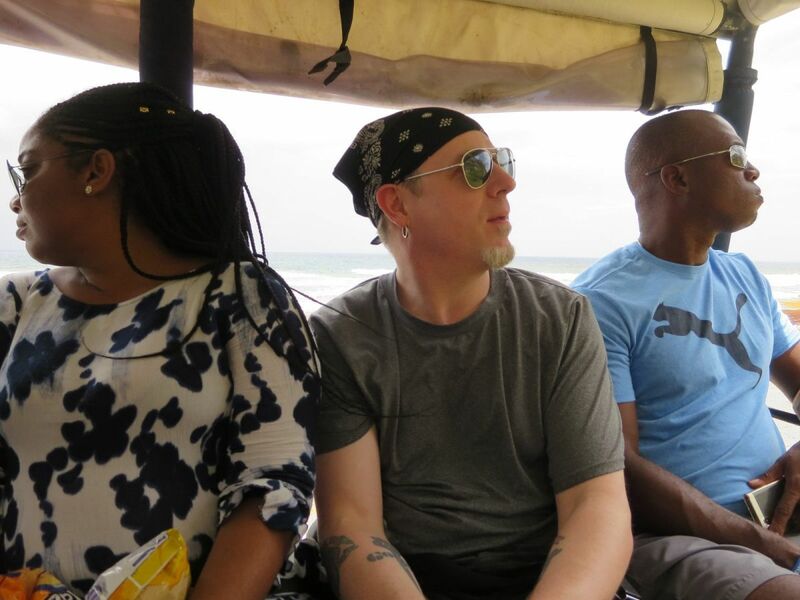 Damien and Monique showed us a great time and we are thankful for their hospitality on this trip.